Two Sister’s Farm came about in a rather unusual way, I had just given up smoking and wanted something to take my mind off cigarettes. 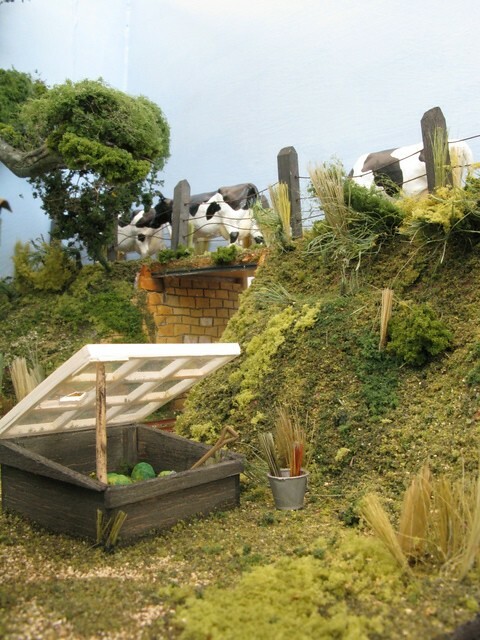 There was a competition on a website that no longer exists to deign and build a layout in less than four square feet. 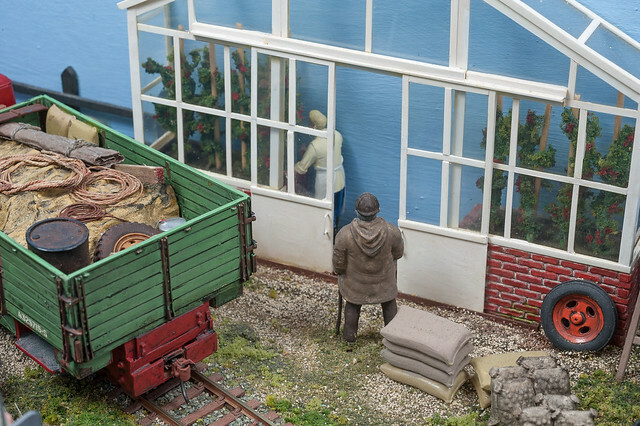 You could use any scale/gauge it was up to the builder to choose. 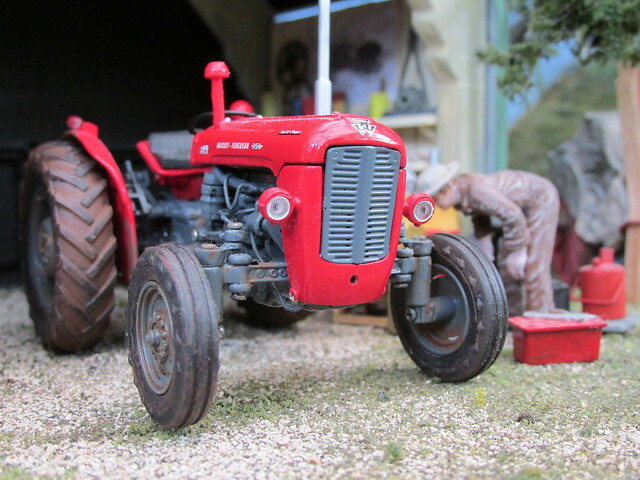 I had in my possession a couple of 1/32 scale white metal tractors and being a fan thought a farm would be a good subject. The larger scale I chose because my eyesight is not as good as it was and my hands are not as dexterous as they used to be. 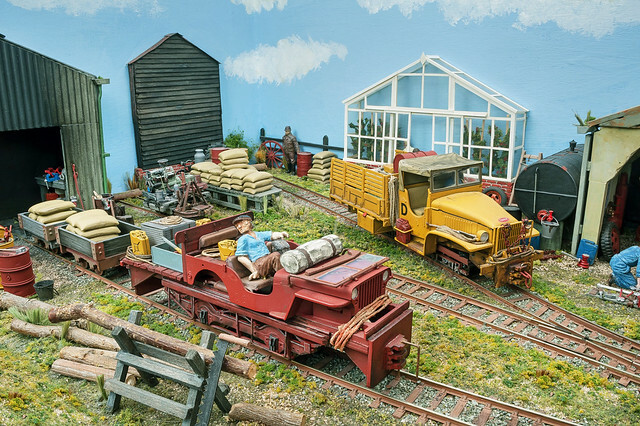 I found photographs of Bedford OB series lorries working in New Zealand in the timber industry converted to rail trucks. 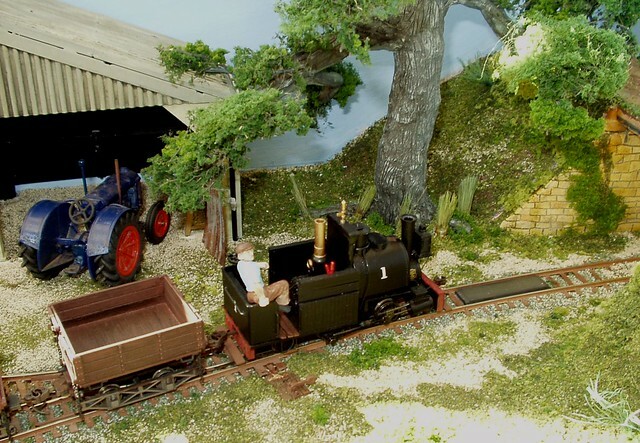 I really liked this as it was so different from the motive power used on most narrow gauge layouts. 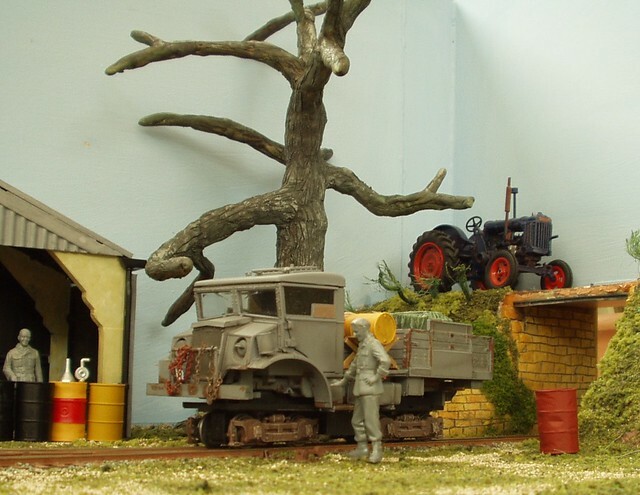 Bought a 1/35 scale Italeri kit of an Opel Blitz which looked rather like the Bedford. 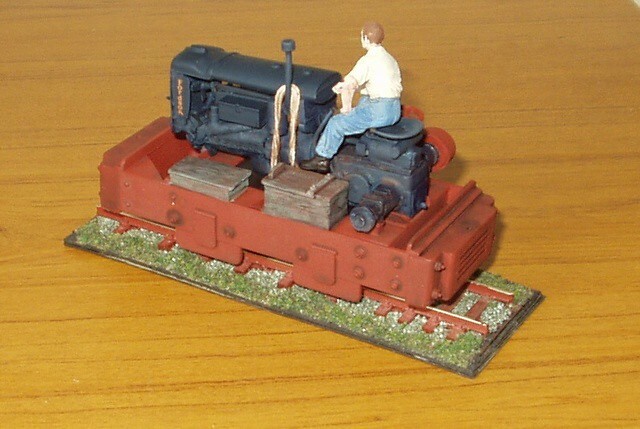 I had in stock several Athearn switcher chassis. The question was could I make the Opel body fit over the chassis? 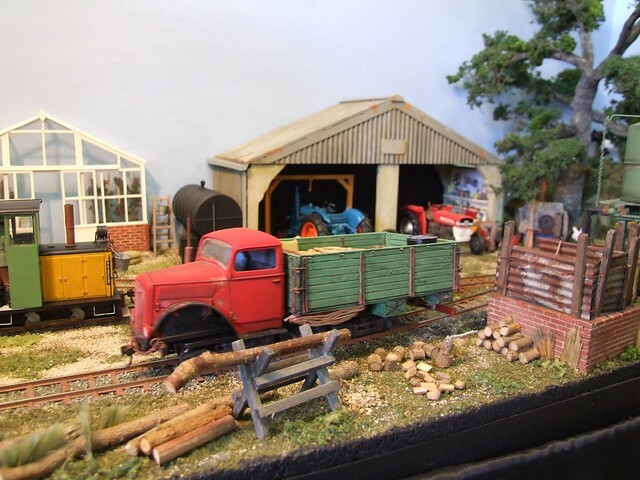 Looks really good Peter, thanks for sharing. We have ran similar competitions in the past. How did you place in the competition...? I am pleased to say it won. 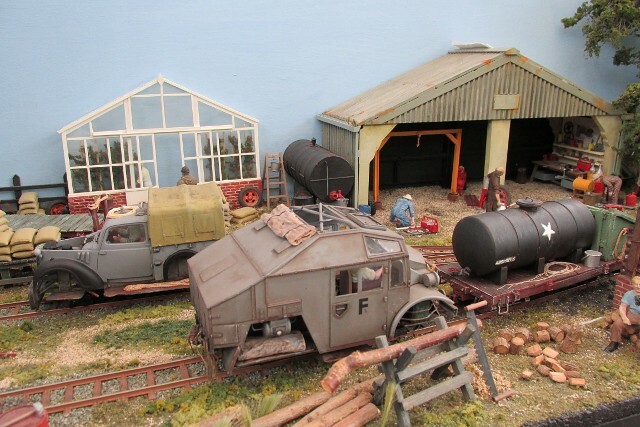 When they were assembled they were both sprayed with an acrylic grey undercoat as a base coat. 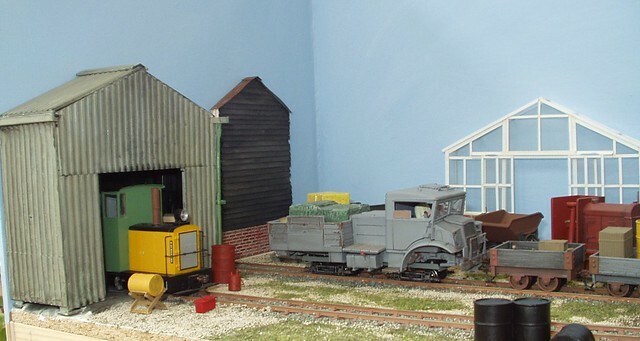 The engine house was then painted in a Humbrol light grey. The supports of the barn were hollow so I filled these with polyfiller to make them look solid. 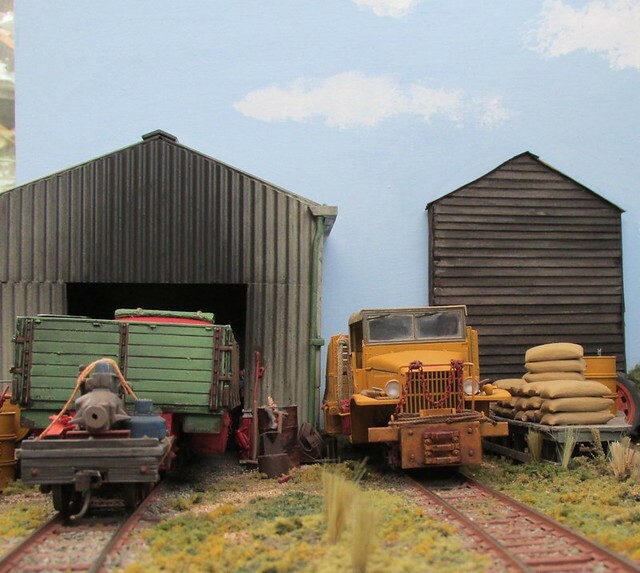 I took some photographs of similar barns found locally to match the colours more accurately. 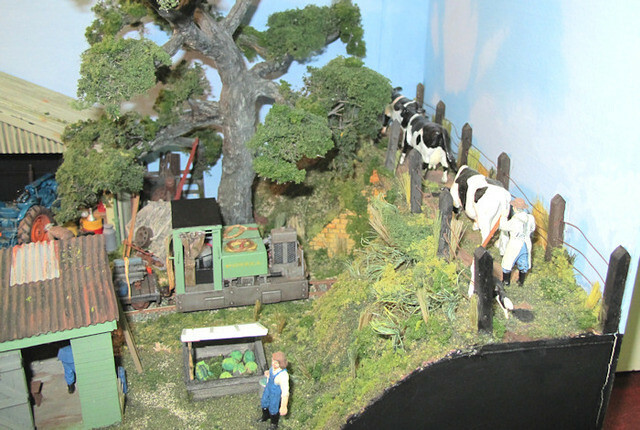 Next to the engine house is a low relief barn made of balsa painted with watered down Indian ink. 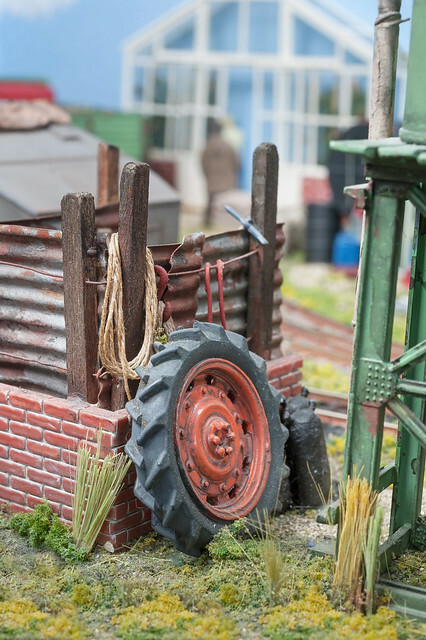 It has a rusty corrugated iron roof and a brick base from yet another Tamiya war damaged building. The jeep being rather small really does sit on the chassis and to give it a bit more character I added a load carrying platform behind the four seats. 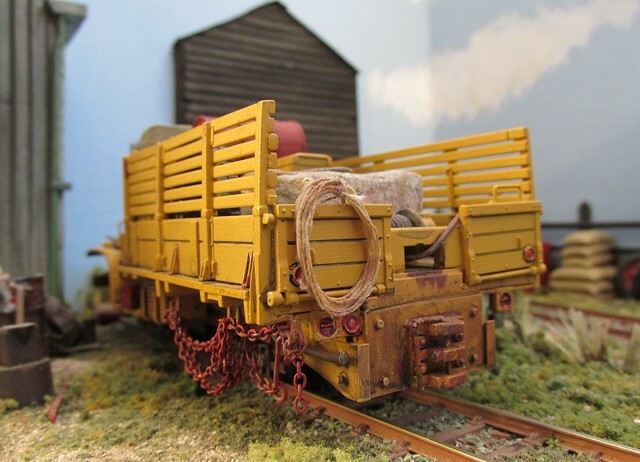 The vehicle is fitted with link and pin couplers so can be used to push or pull small trains when needed. 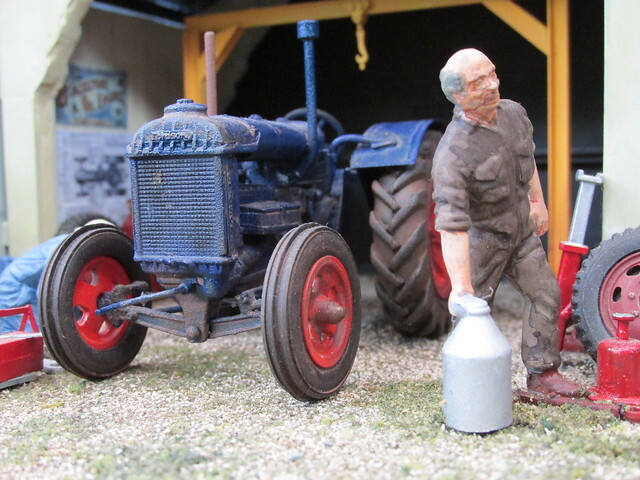 The driver figure is a white metal tractor driver from Scaledown models, he also adds a bit more weight. 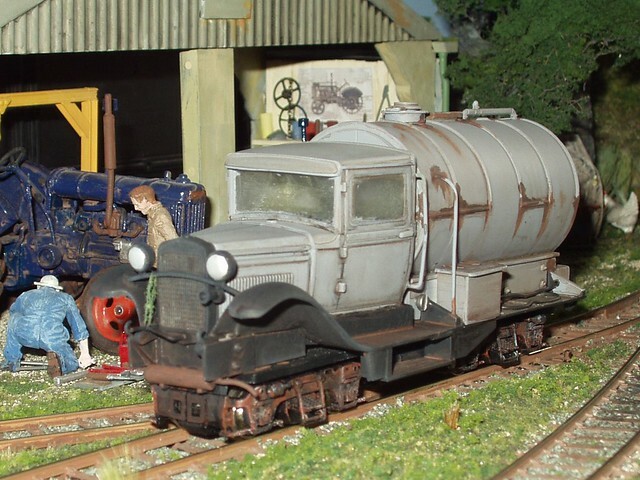 It reminded me of a vehicle which worked on the Dennis estates at Nocton Lincs. 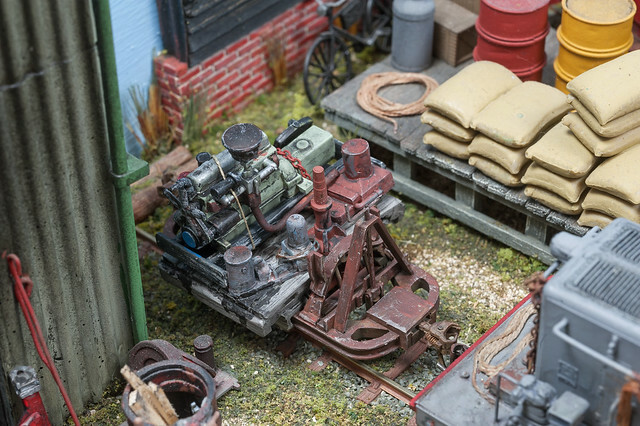 It was a strange looking car type paraffin-fired steam engine device. 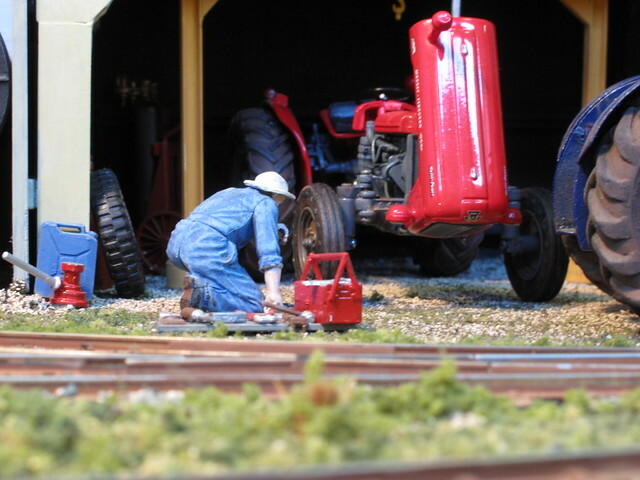 The model is used by the foreman to get urgently needed fuel or spares out into the fields. 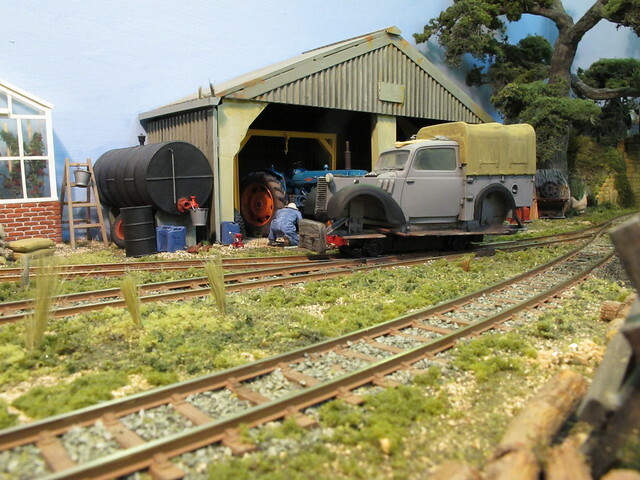 The trailer I painted a dark well rusted colour and it stands leaning on a fence next to the tractor workshop on the right hand side. 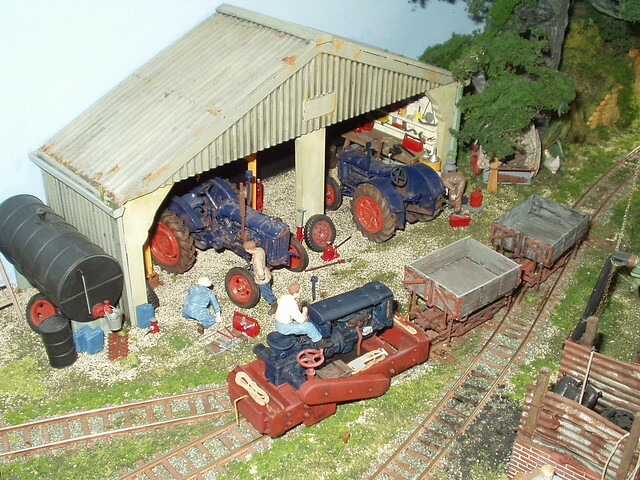 It is full of rusting junk, farmers seem reluctant to throw things away. 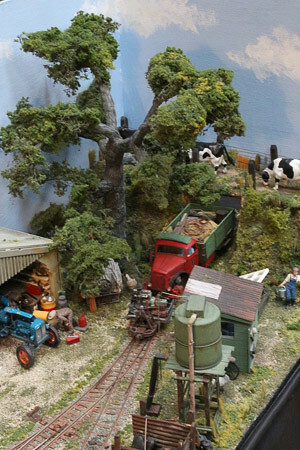 More junk, long grass ( old shaving brush bristles ) and foliage were added with a liberal soaking of pva to help secure the tree. 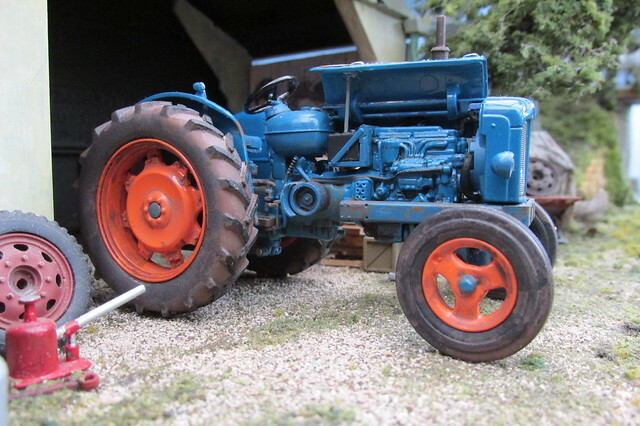 A Fordson 27N, my favourite tractor. I remember as a lad sitting on one that my cousin used to drive. 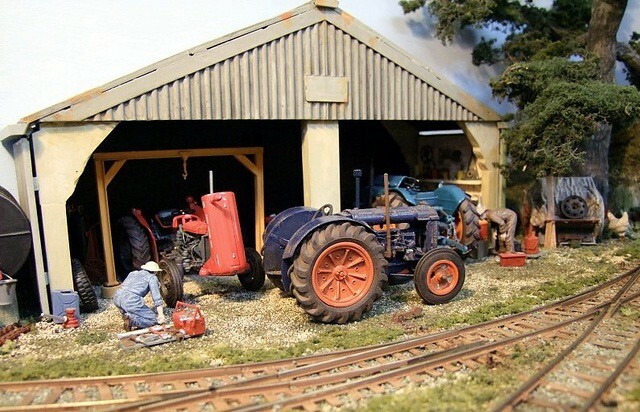 The smell of a tractor running on paraffin instantly takes me back to my childhood. 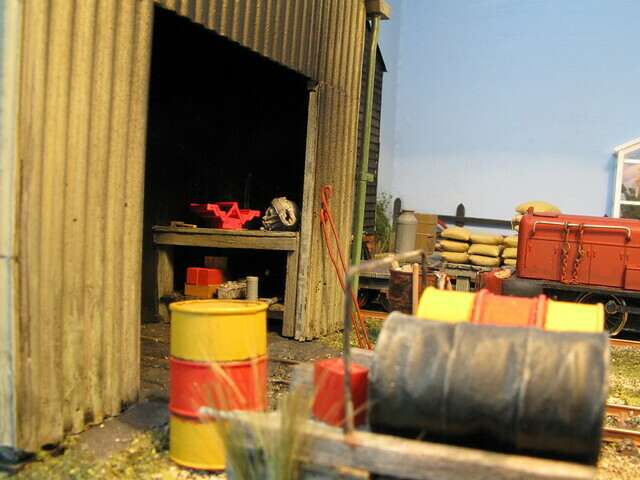 Note the workshop starting to fill up with clutter and the contentious lubrication chart on the wall, it’s for the 27N actually. 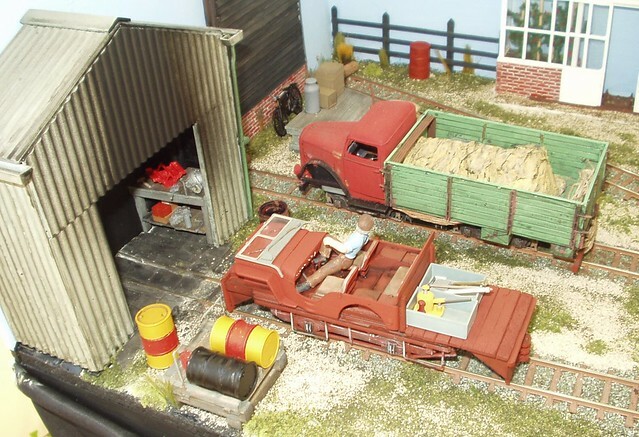 The loading dock made of balsa and painted with acrylics. 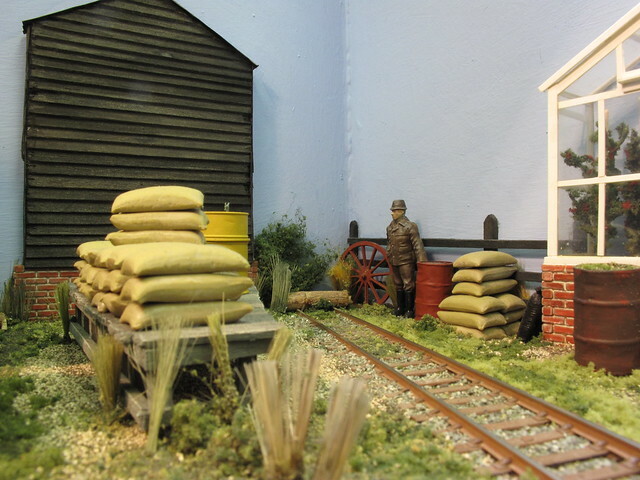 The sacks are Tamiya sand bags and the milk churn is a Britain’s item. 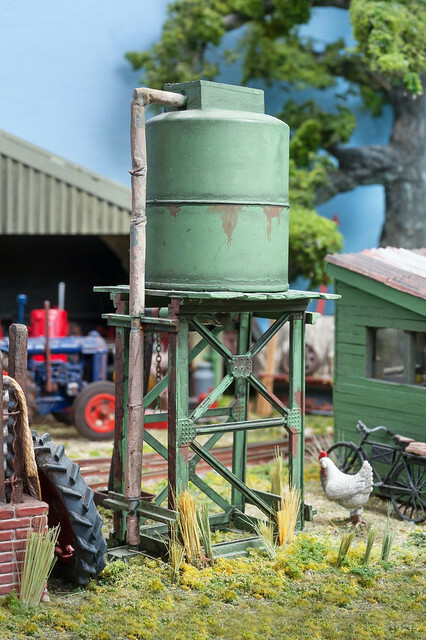 The bike leaning against the barn is from a Tamiya Military kit. Bicycle riding assault troops, it beggars belief. 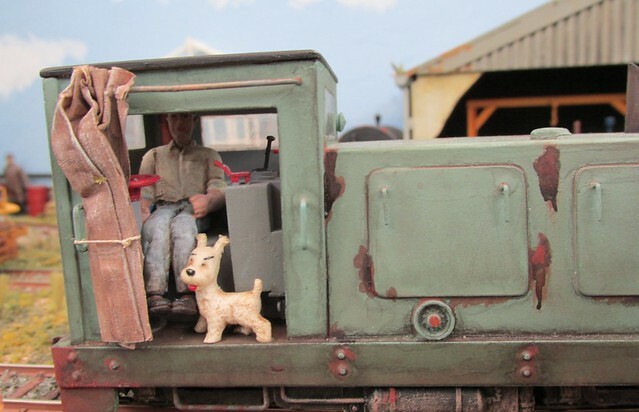 The little used Barclay can just be seen lurking in the background. 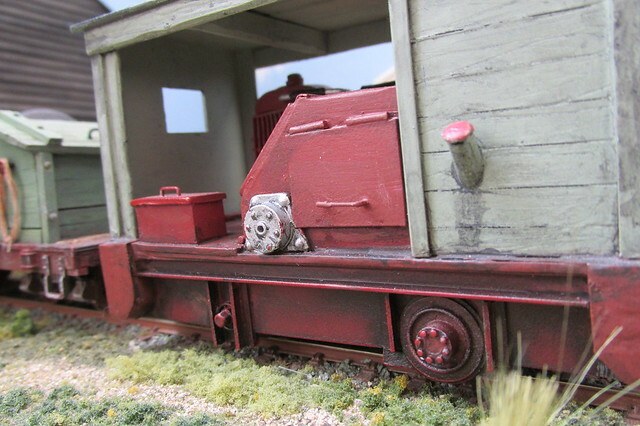 A close up of the Opel Blitz truck showing the KD coupler fitted to the front. 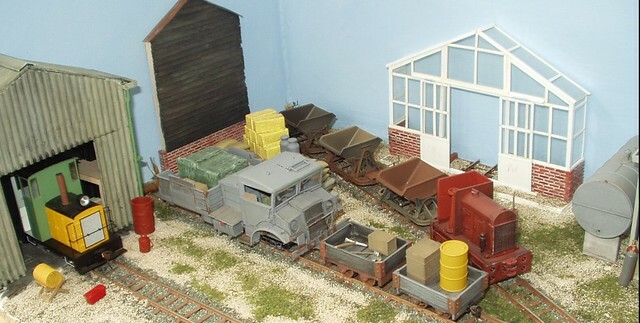 These truck kits after conversion yield a load of bits for the scrap box, items like axles wheels and even a complete engine. 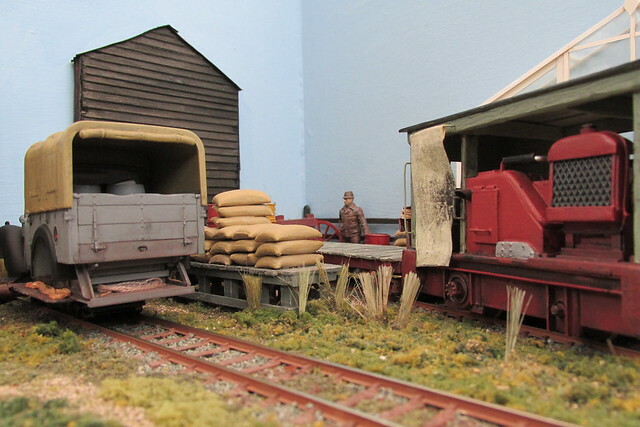 The latter I’ve used as a load on one of the little Side line four wheel wagons. It makes a change from sacks of potatoes. 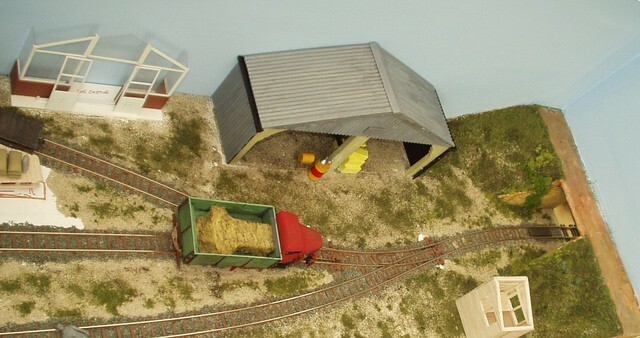 This picture shows the Opel arriving at the yard and passing the work shop where a couple of tractors being serviced. 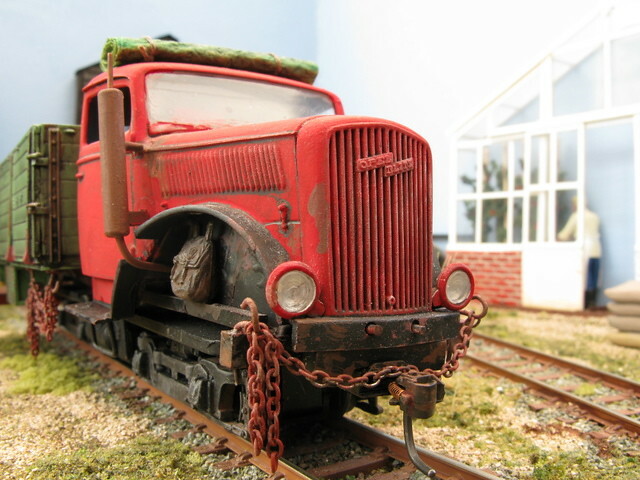 The Chevrolet truck and its Bachmann Brill chassis performed very well being both smooth and slow running. 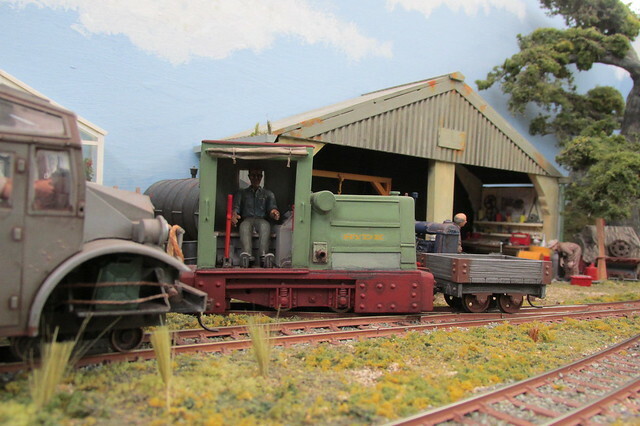 On my layout pulling power is not an issue but I do like decent slow running. 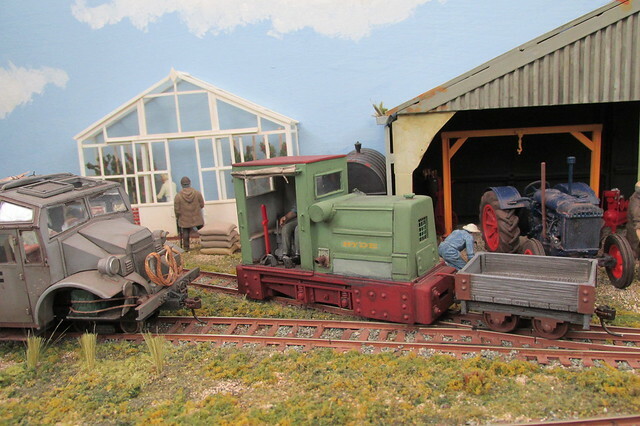 I looked around for another truck that I could motorise using the same chassis. 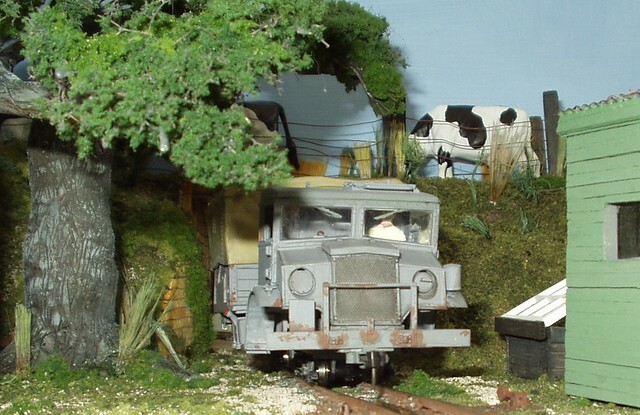 I had long fancied the American Army 6 x 6 GMC truck to convert to a rail truck. 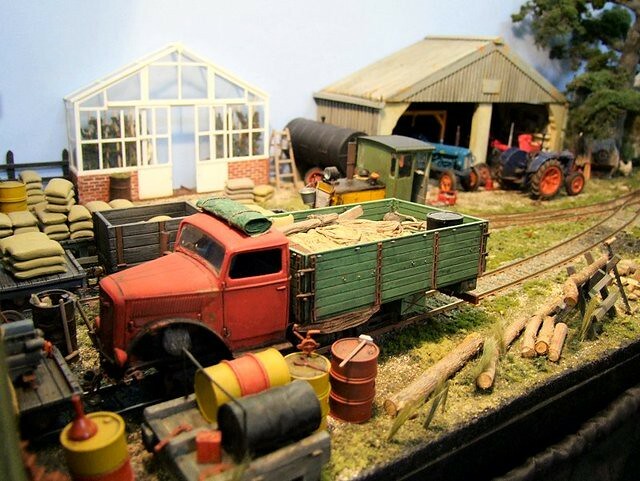 I ordered one and the Brill trolley I was going to power it with from my local model shop. 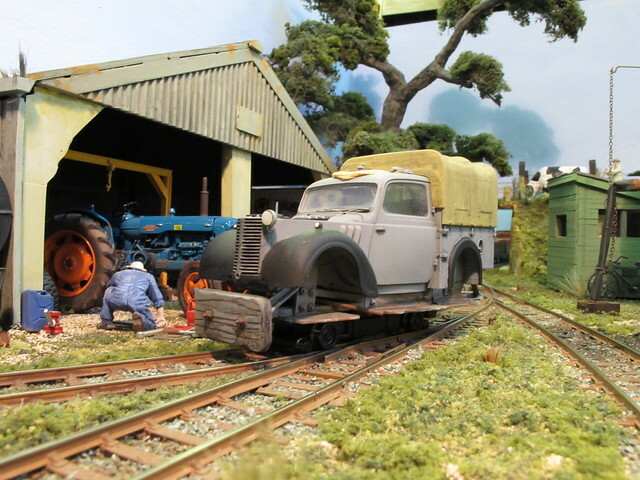 When the two eventually arrived the truck needed much more in the way of alterations to get it to fit the chosen chassis. 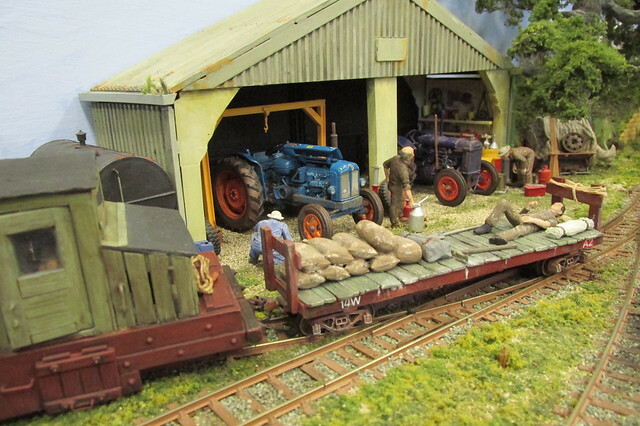 It was much too long for a start so a length had to be removed from the middle of the load carrying section. 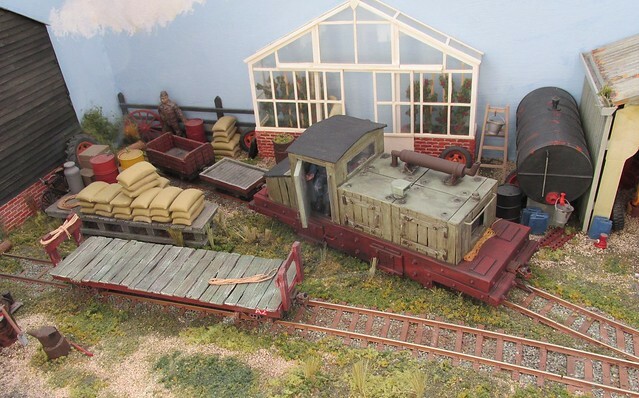 This left the bonnet and cab section to build more or less as the plan, apart from removing sections of the cab back, floor and engine bulkhead. 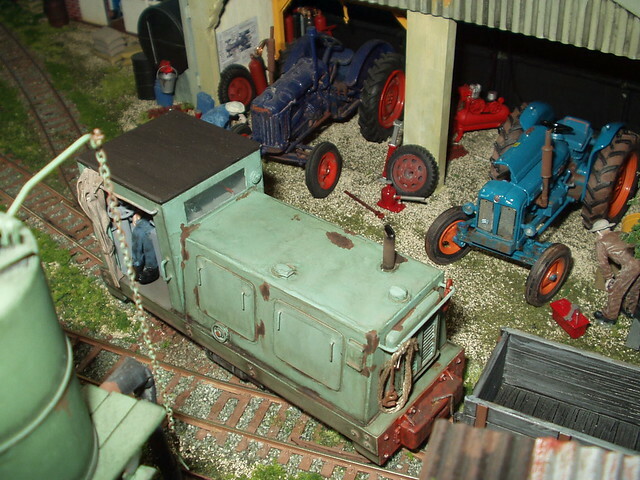 The truck chassis itself had to be shortened and a sub chassis made to fit the truck body to the Brill chassis. 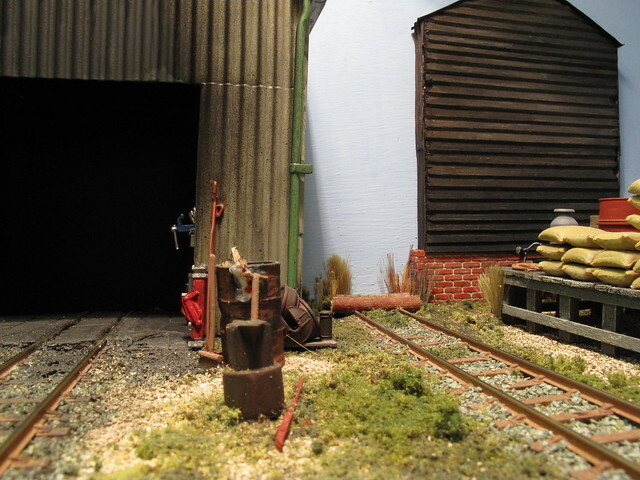 All a bit fiddly with lots of trial and error fitting of parts. 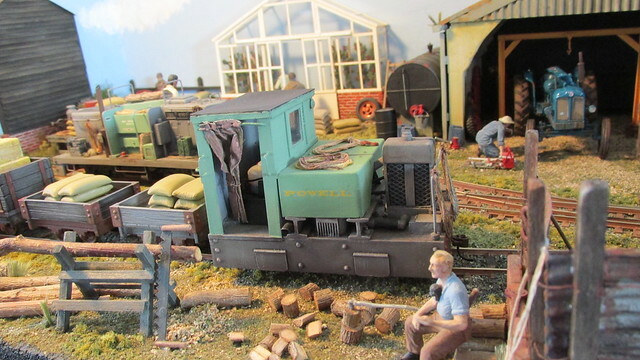 Eventually it all fitted together well and to hide the motor I did my usual trick and made a box to go over the hole in the floor where the motor intruded into the truck load compartment. 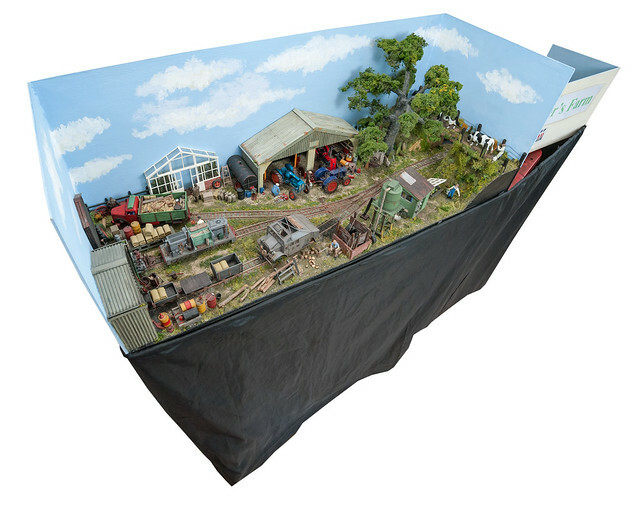 The box is then covered over with a tarpaulin. I tried using a tank by way of a change instead but it didn’t look right somehow. 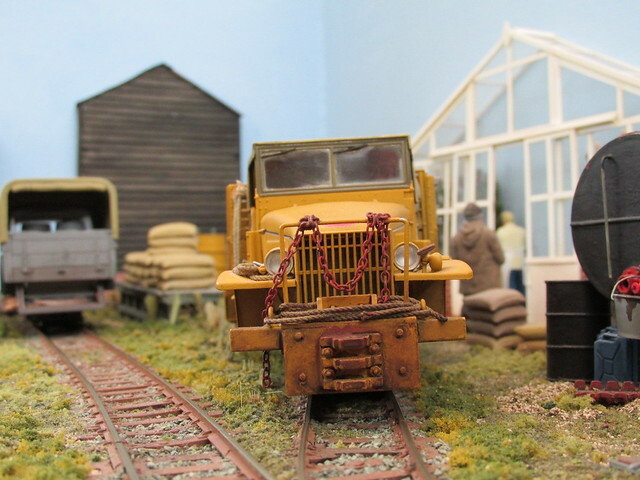 The truck in the kit should really have a large electric powered winch mounted on the front but I thought the front looked ok without it so I fitted the winch in the back instead. It has link and pin couplers at each end. 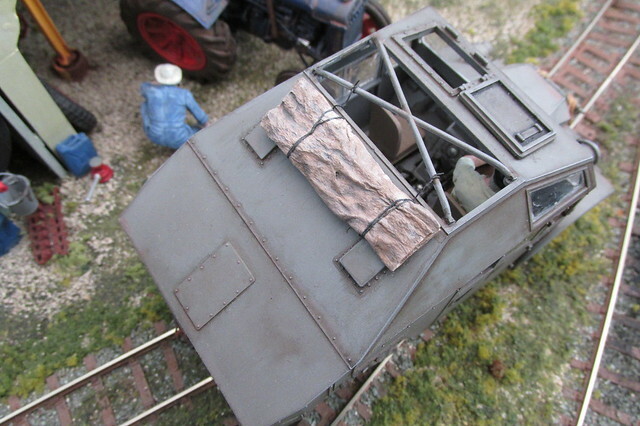 The guard around the radiator I cut so it just fitted the profile of the bonnet. 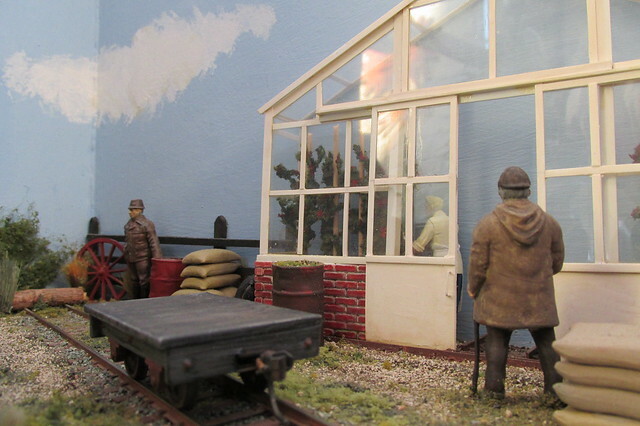 I sprayed it a rather bright yellow which I toned down with several thin dark grey washes. 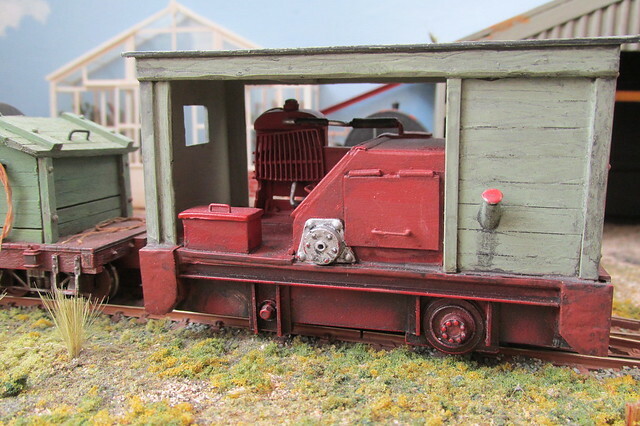 The canvas hood over the cab I painted with a matt oil based paint in a fawn colour then gave it a wash of very dilute Indian ink. 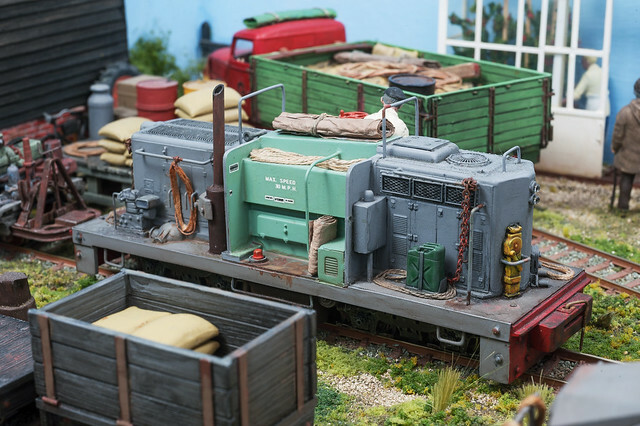 A spare gerry can of fuel is carried each side of the cab mounted on the running boards. 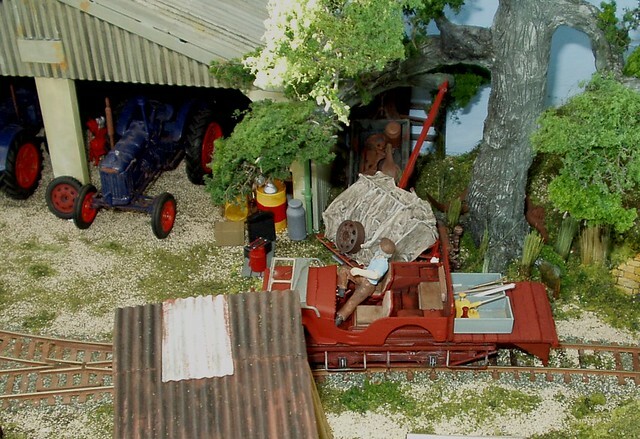 I then added the usual tools, shovels ropes and chains draped over various parts of the vehicle. 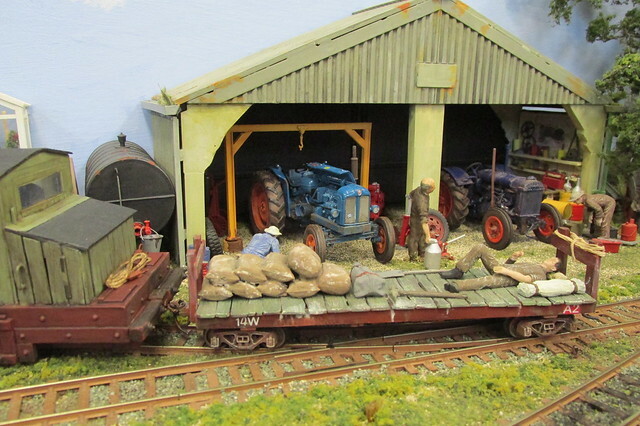 In the load carrying area is the large tarpaulin covered crate, a forty gallon oil drum, a selection of gerry cans, a spare implement wheel some folded tarpaulins and more rope. 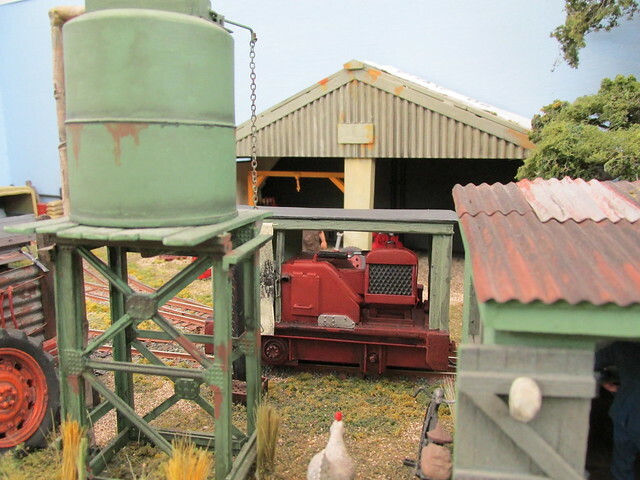 At the very back is the electric winch mechanism. 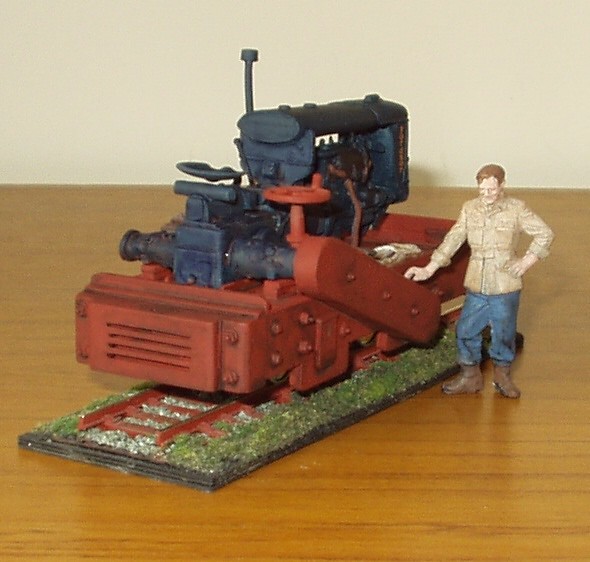 I thought it about time I increased the size of the conventional locomotive fleet. 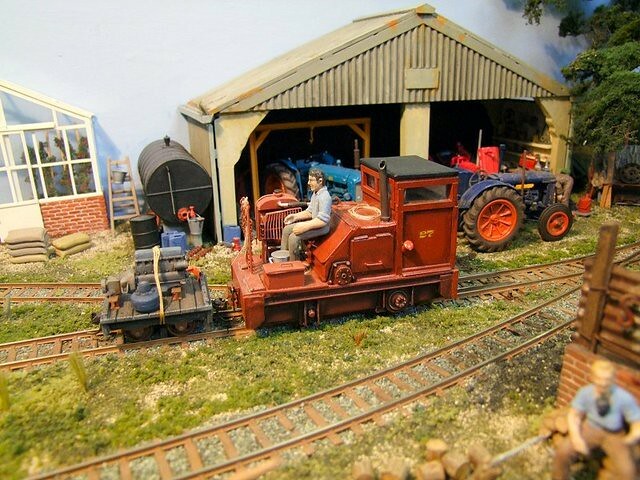 So I made a sort of Simplex type device that might have been built in the farm’s own workshop on a chassis they had purchased second hand. 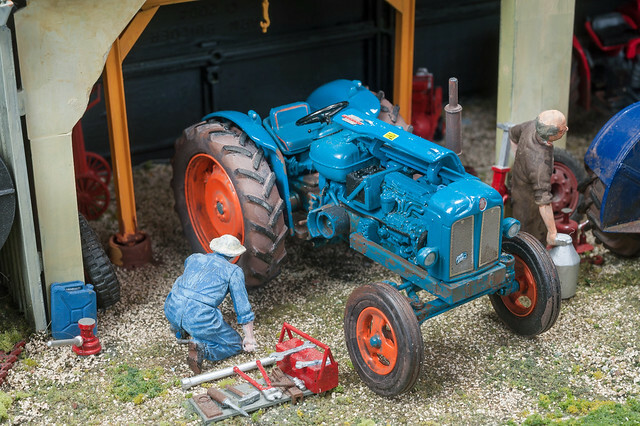 The model is powered by a Model Power four wheel chassis with a vertical motor at one end and a large metal weight in the middle. 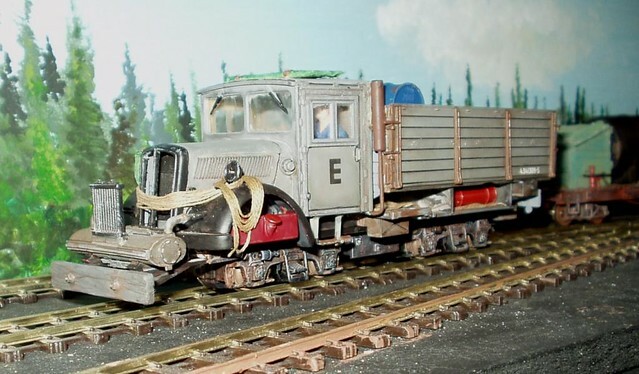 I took the HO scale body off the power chassis and removed the body, filing it flush to give me a basis for the scratch built body I was making. 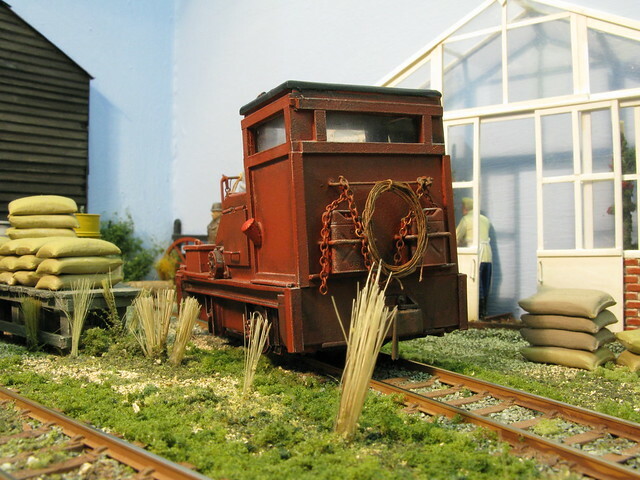 The modified body clips to the power chassis with four little pips. The body is totally freelance and I assumed that the farm workshop wouldn’t have the equipment to bend sheet metal so all panels are flat. 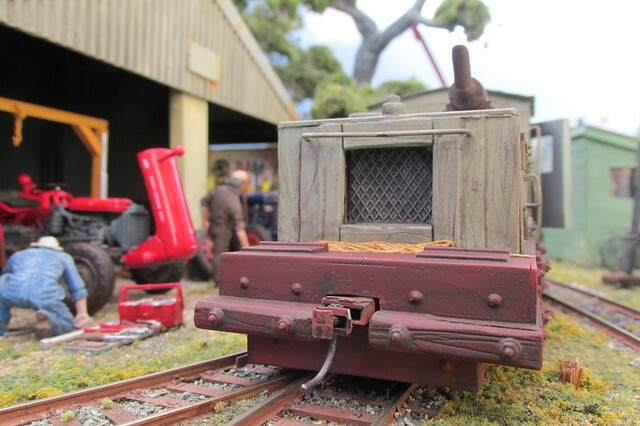 The engine cover has doors each side with hinges and handles and hides the central weight. 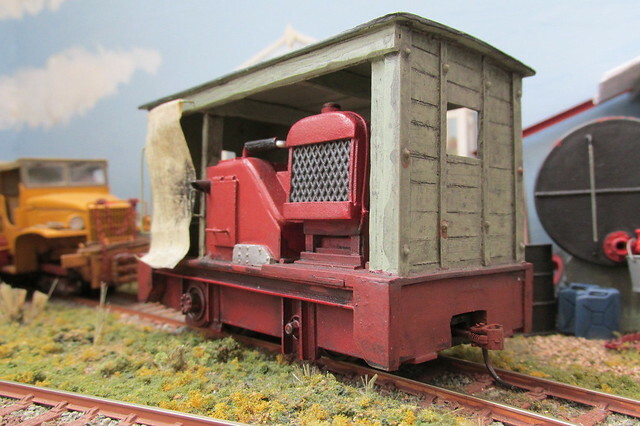 An open sided cab covers the vertically mounted motor. It has a curtain made of folded and painted masking tape to hide the fact there is no driver, there simply isn’t room for one. 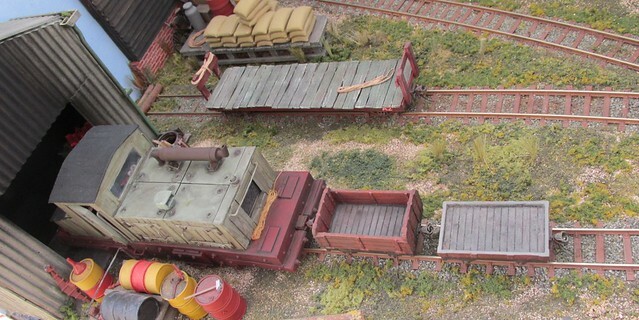 During the build I added small bits of lead weights wherever I could to improve the model's tracking abilities. 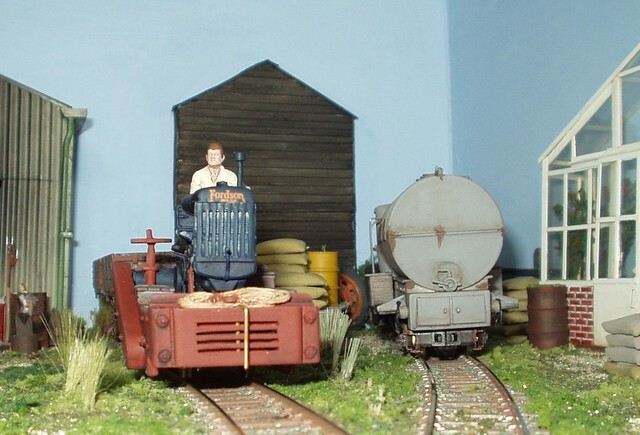 The front footplate has a sideways mounted radiator with a fan and drive belts behind a guard. There are top and bottom radiator hoses and even an overflow pipe. 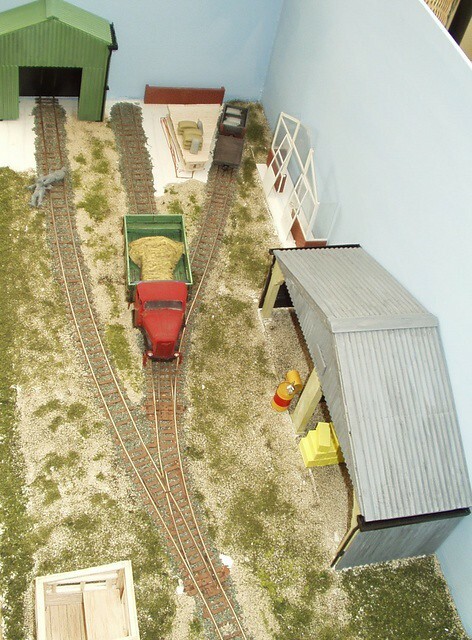 There are two sandboxes and a tool box as well as a handrail. 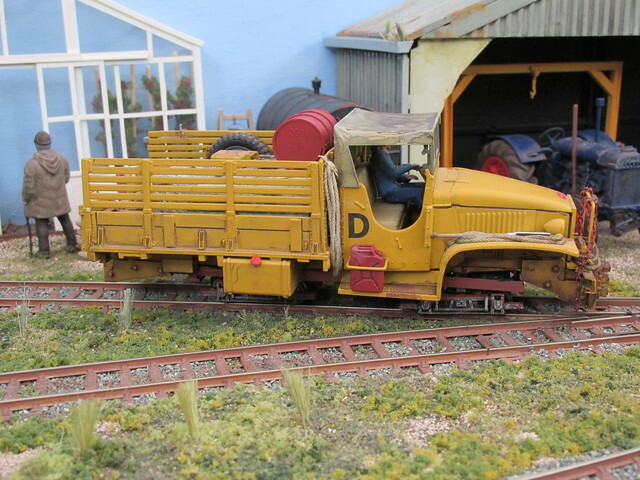 There is another handrail and spare fuel cans mounted on the rear of the cab. I sprayed the body in red primer then washed it over with diluted black Indian ink. Then I flicked a dry brush loaded with light grey over it to high light the raised areas. I hung chains and loops of rope from the hand rails to give it a little more character. 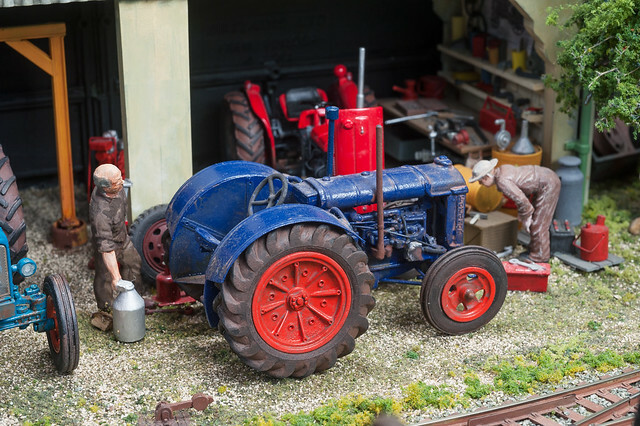 Since most of the photographs were taken (apart from the close-up back view) I’ve added a seated figure riding on the engine cover, he’s supposed to be getting a lift out to the fields. 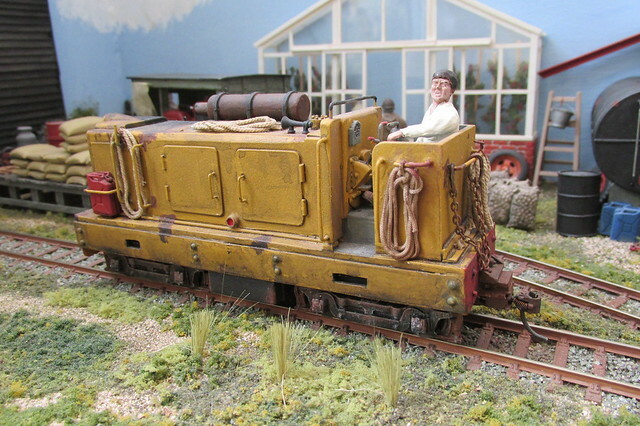 The next shunting locomotive is not to be taken too seriously. 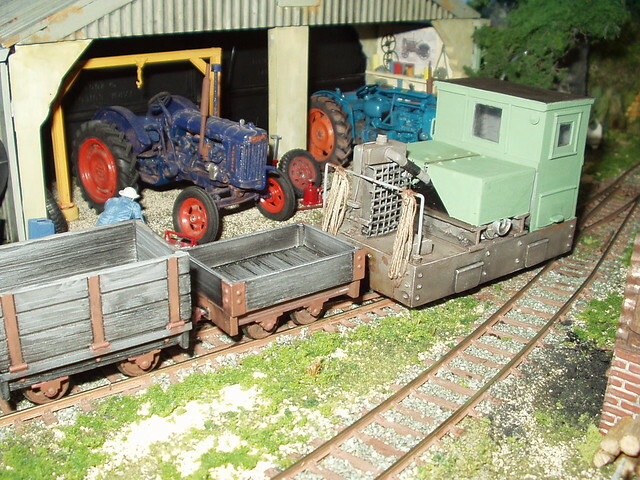 I built it from a selection of unused body parts and a switcher chassis from my spares box. 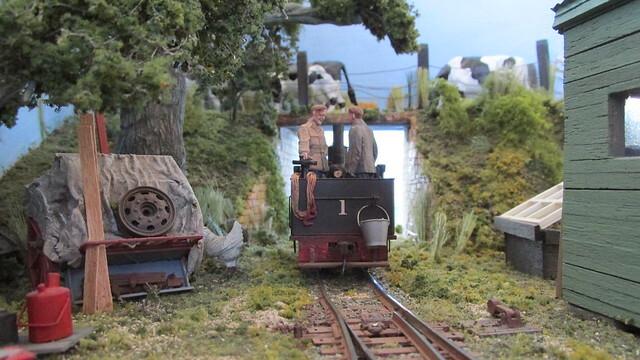 They came about as I have been updating my American switching layout with more modern locos and stock. It’s a device I really don’t think there is a prototype for! 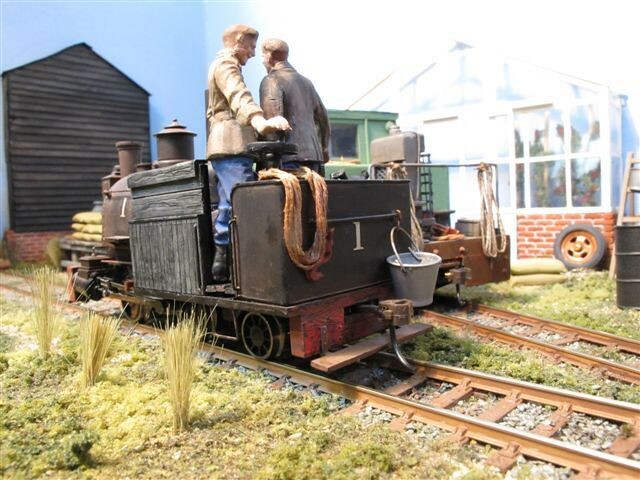 The fiction is that it has a Gardner four cylinder diesel engine at one end (the right side in the photo). 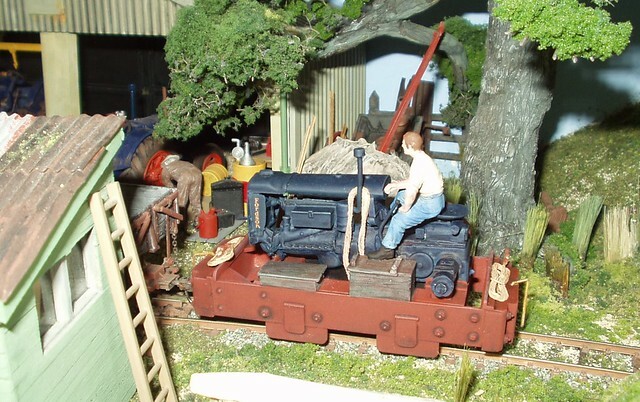 This drives a generator at the other end by a long shaft that passes through the middle of the loco behind the driver’s seat. 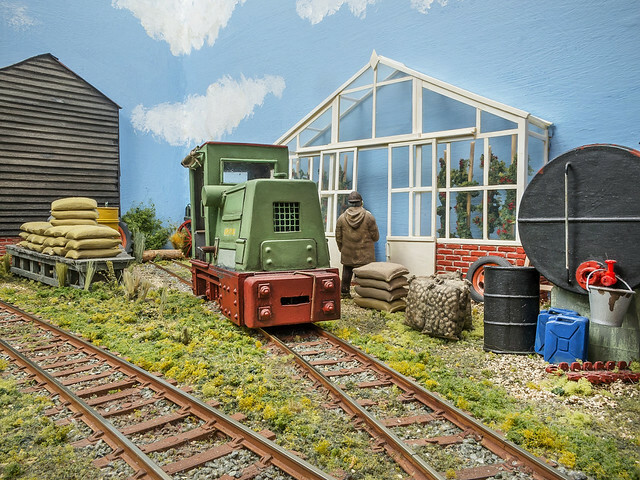 It can be used as a portable generator out in the fields as well as being a conventional diesel electric to power the traction motors in both bogies. 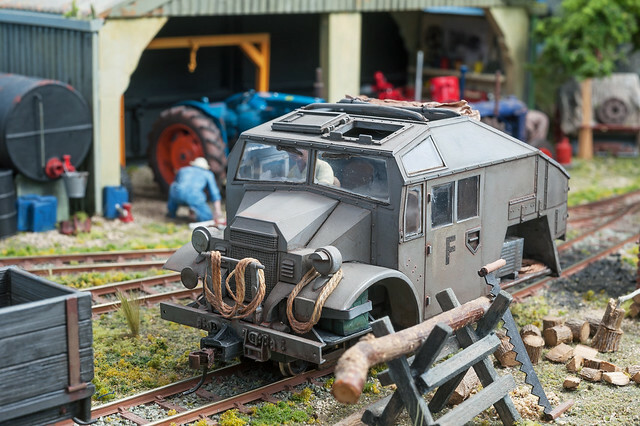 The driver is a modified Tamiya military figure. Seen on my test track. 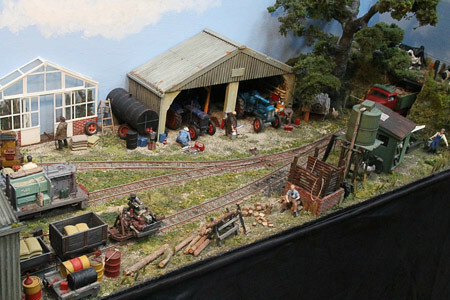 A few years ago I exhibited Two Sister’s Farm at two specialist narrow gauge shows organised by two different local groups. 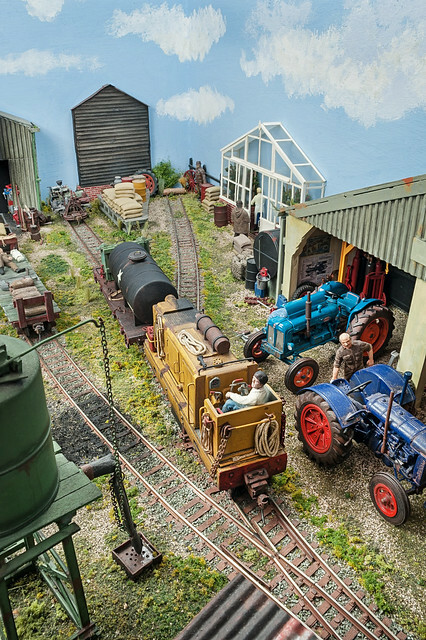 Not only were they very enjoyable due to the friendly informal atmosphere but also because of the variety of scales and subjects of the exhibits. 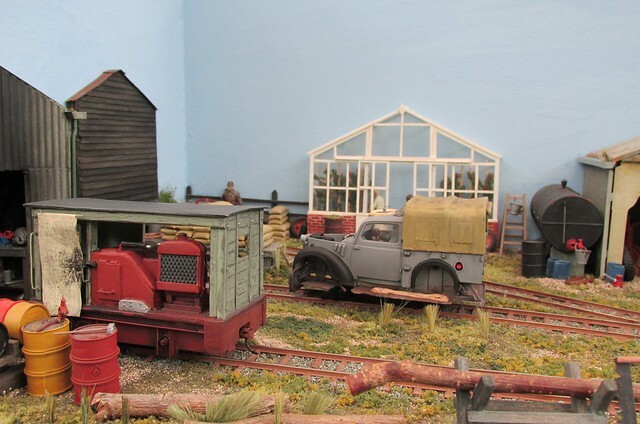 Whilst there my layout was photographed by Mick Thornton and I recently e-mailed Mick to ask permission to use a photograph to illustrate a forthcoming item in the saga. He not only gave permission but sent me a lot more of his excellent photographs as well. 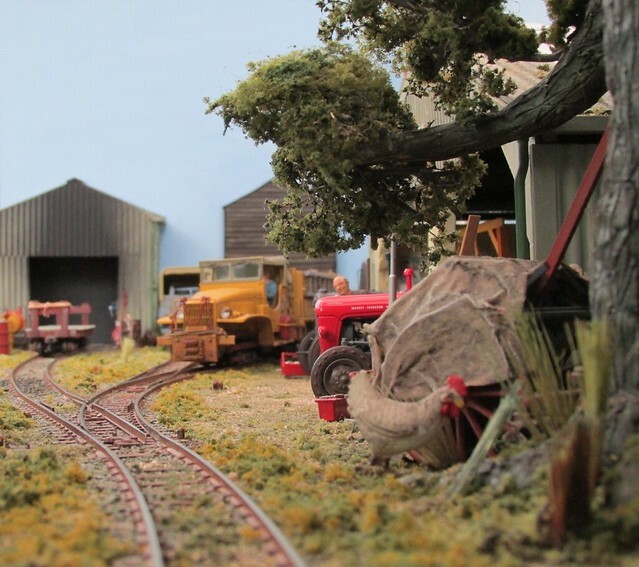 Here are two of Mick’s excellent photos of the layout. 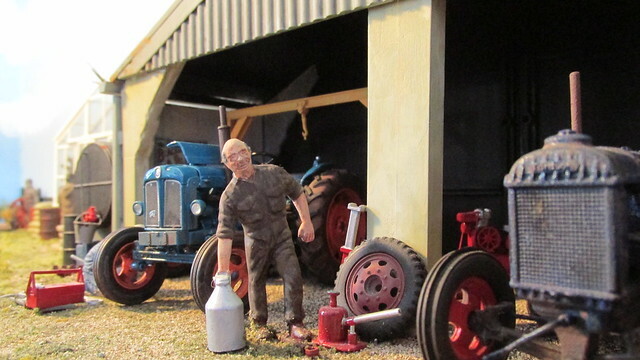 The first picture shows the Fordson “N” standing outside the barn workshop warming up before setting off for the fields. 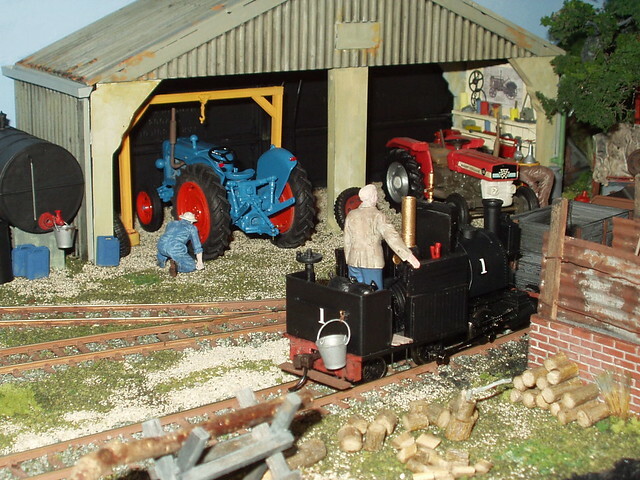 The second shows the Simplex with a wagon carrying an engine for repair. 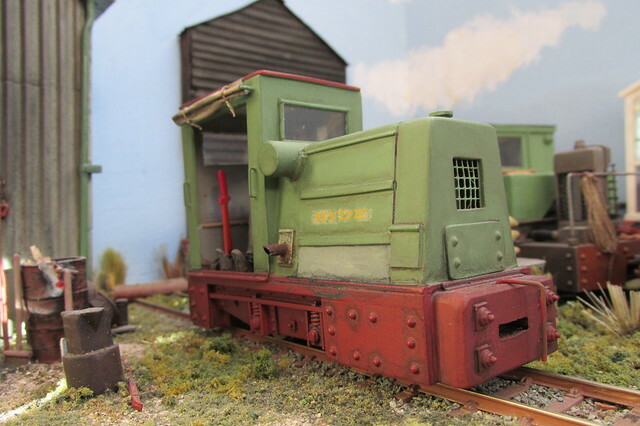 Due to the small size of the layout four wheel shunters are a bit more flexible so I added another to the growing fleet of locos and rail trucks. 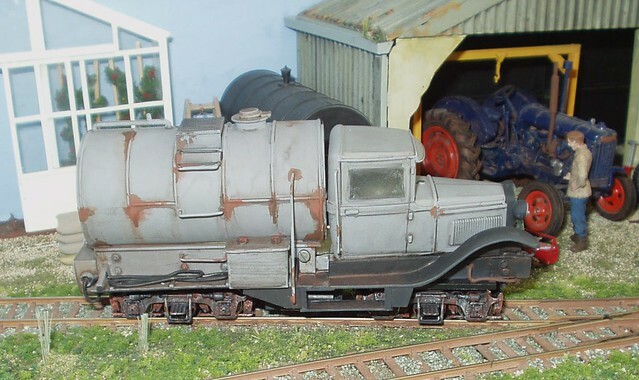 Because the bauxite coloured Simplex type ran rather well using the Model Power Chassis I bought another. Roaring inflation had increased its price by some 50%, but I thought it still reasonable in today’s inflationary times. This time I found a drawing of an armoured simplex and used the basic dimensions to build mine with the exception of the curved sides. 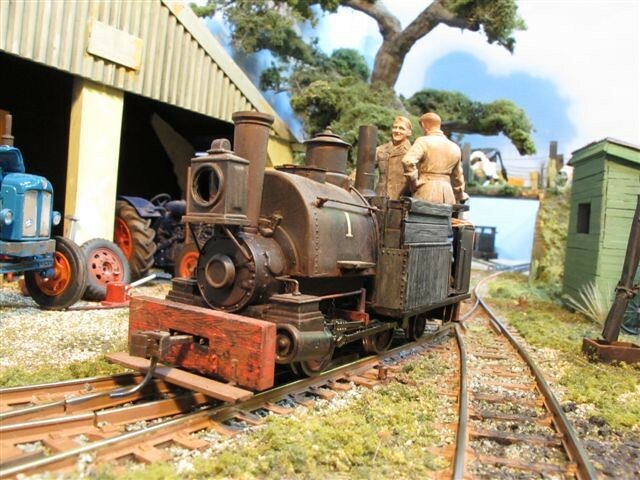 Again the Two Sister’s engineers shied away from curving metal and squared up the sides of the second hand ex WD chassis they had acquired. 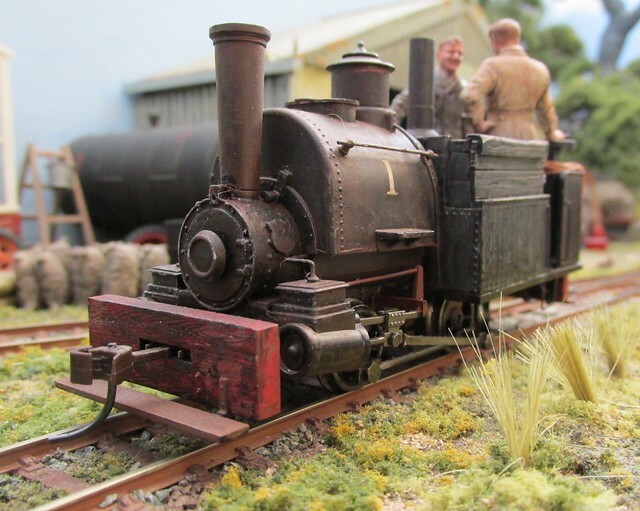 Because it was wider I was able to put more weights into each side of its plasticard footplate. 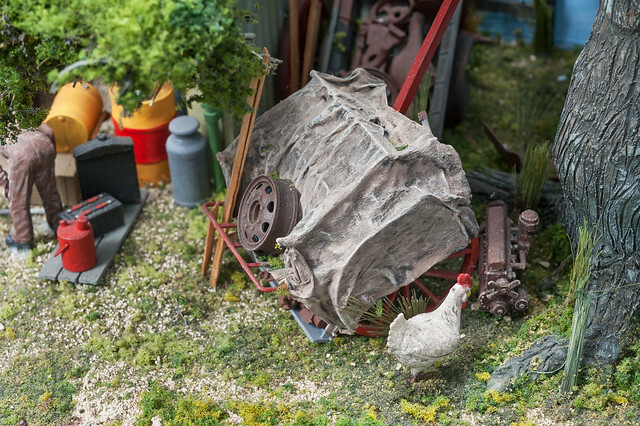 The cab, engine cover, radiator are all plasticard with some Cambrian 16mm scale rivets and nuts strategically placed. 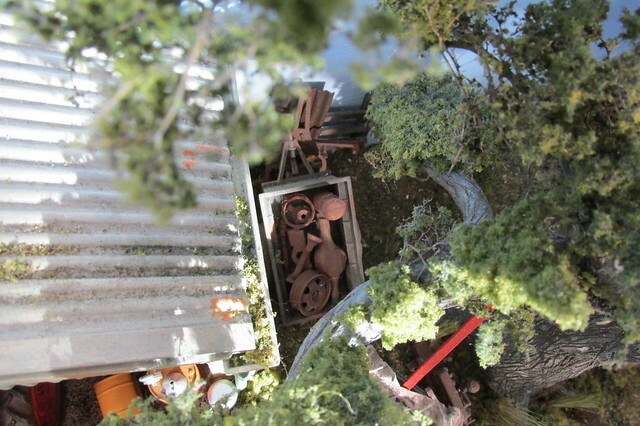 Odds and ends from the spares box serve to represent parts of the engine and transmission seen below the bonnet cover. The wire grill is made from the reinforcing from some industrial tape soaked in ACC to make it rigid. 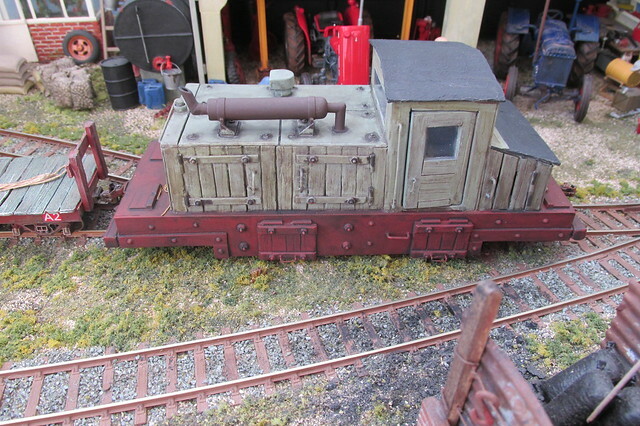 This time I sprayed it with grey primer then painted the body in a light green colour purely to make a change. 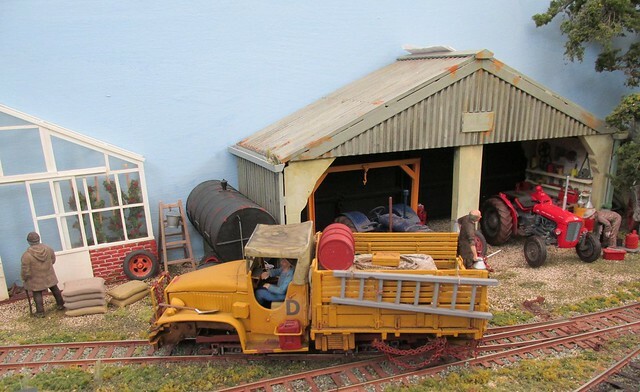 It is very lightly weathered because I assumed its regular driver looks after it. 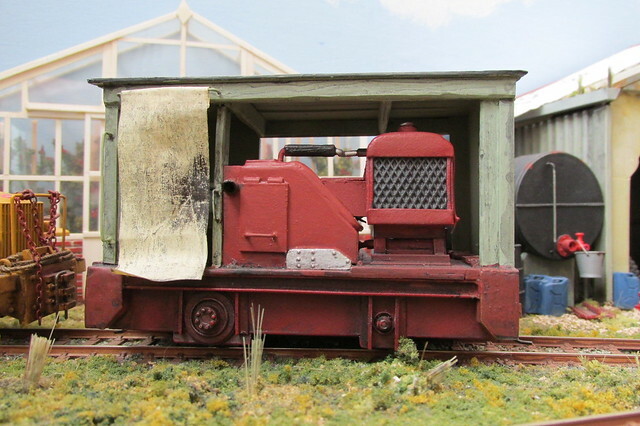 The next shunter I made was powered by another Athearn switcher chassis that I had been given. 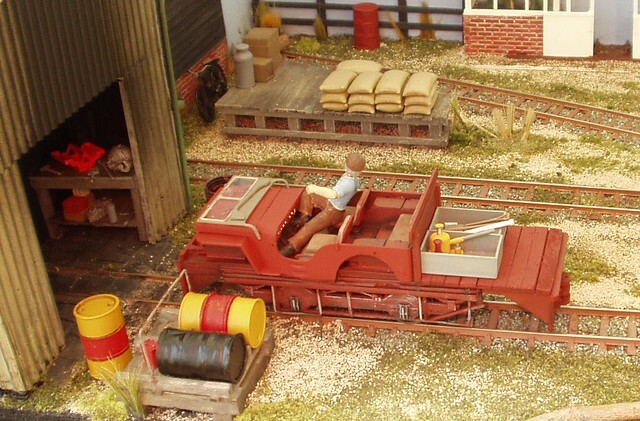 Again it is a purely freelance design and was built out of plasticard on the base Athearn switcher basic footplate that had had the body removed. 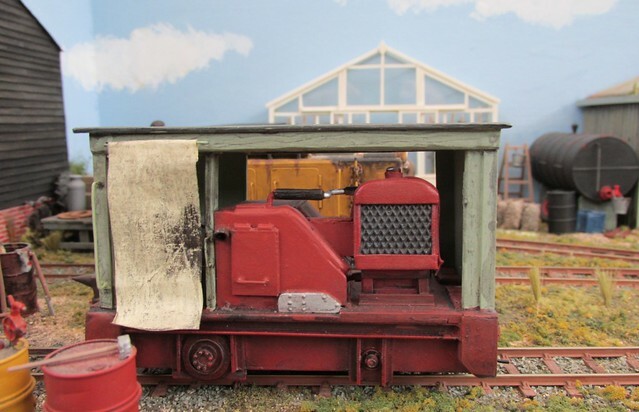 I removed one of the flywheels and a drive shaft to give more room at the back end for the cab and this allowed a seated driver figure to be fitted in. 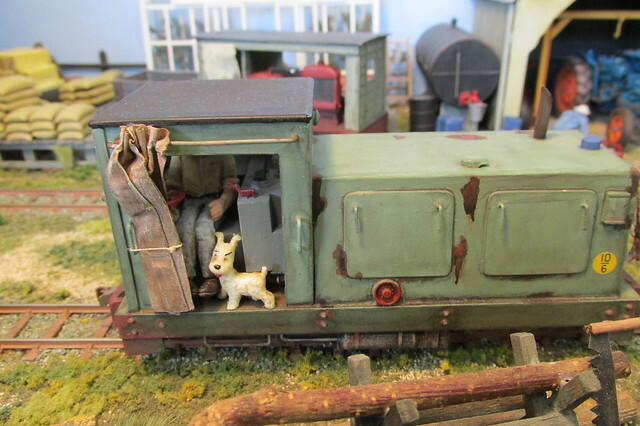 The body is the usual bodge with a couple of doors to allow access into the engine compartment. 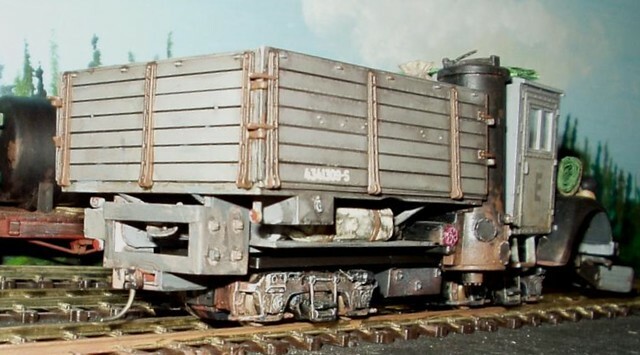 The radiator was from an Athearn Hustler body and it is open to allow air in to keep the five pole motor cool. 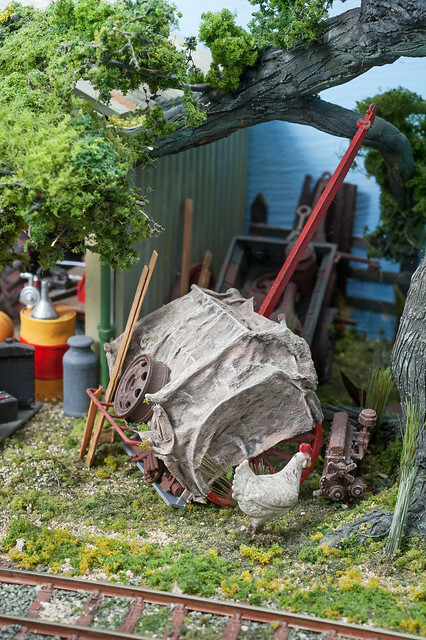 It’s got the usual handrails and bits of rope and chain hanging from them. It has link and pin couplers at both ends. 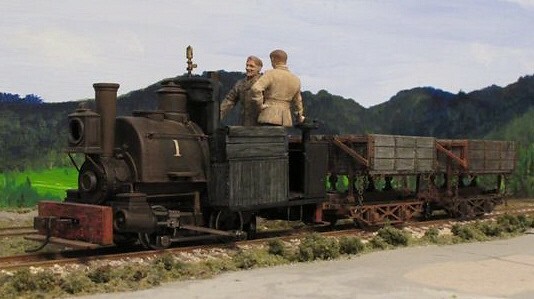 The body is slightly weighted, the Athearn chassis on its own is quite heavy so it is a nice slow runner. 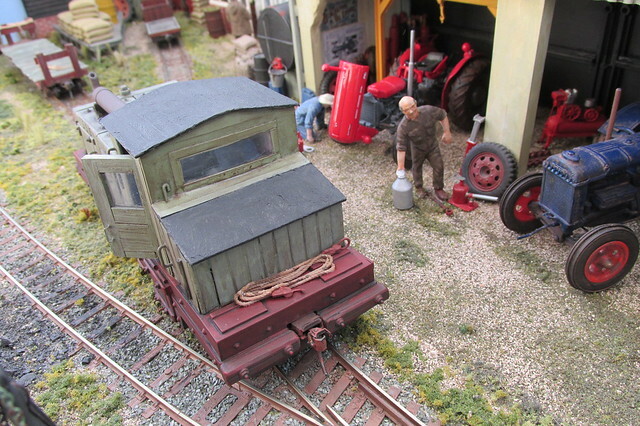 It is painted in my faded industrial green colour with a little wear and tear weathering. 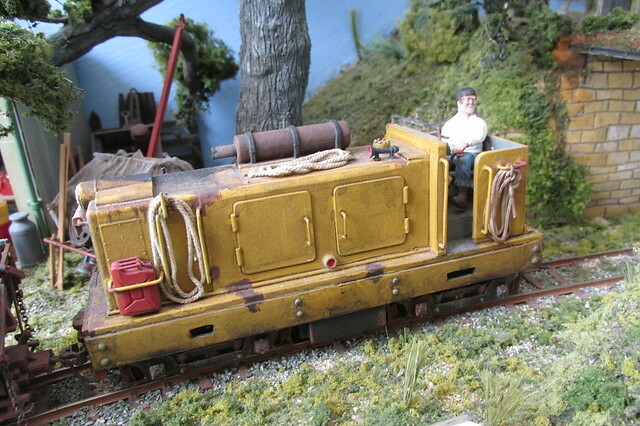 The driver figure is a modified Siku character. 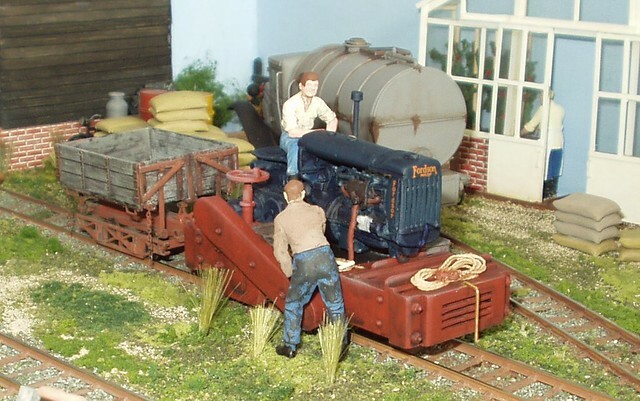 I have never been very happy with the appearance of either the Porter 0-4-2 locomotive or the wooden side tippers. 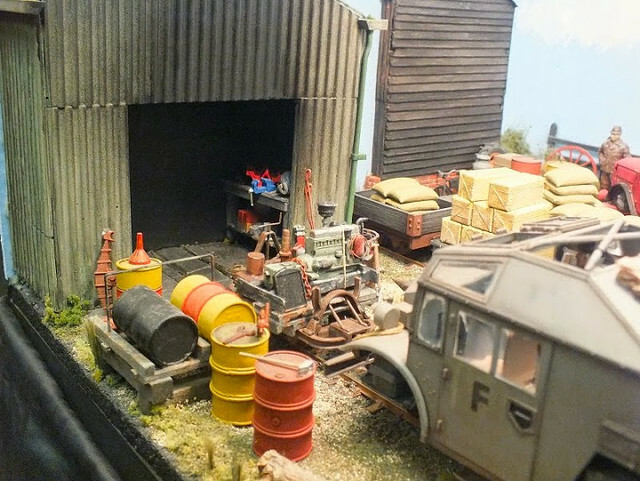 They are all Bachmann ON30 scale models, the locomotive has been modified slightly to make it look more 1/32 scale but the wagons have not. 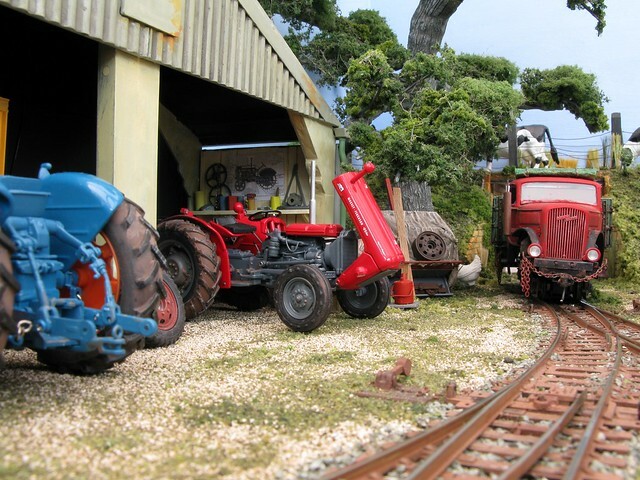 I wanted them to have a rather neglected look about them but not too rusty or decrepit as they are all still used. 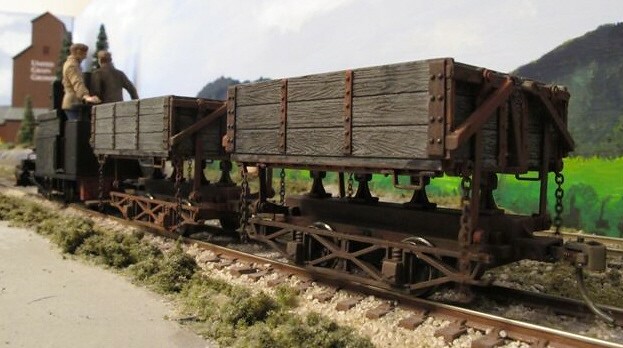 With the side tippers I basically painted the wooden sections a variegated pale greys and then applied thin washes of black to represent unpainted wood. The iron work being picked out in various rust shades. 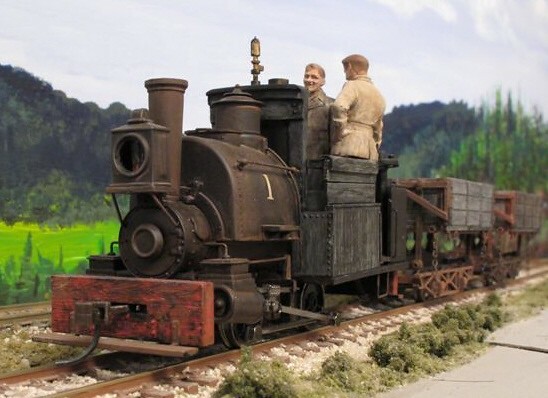 With the locomotive it was washes of rust colours over the metalwork and the same treatment as the wagons with the woodwork. I am now more pleased with their appearance, I think they look a little more interesting than they originally did. 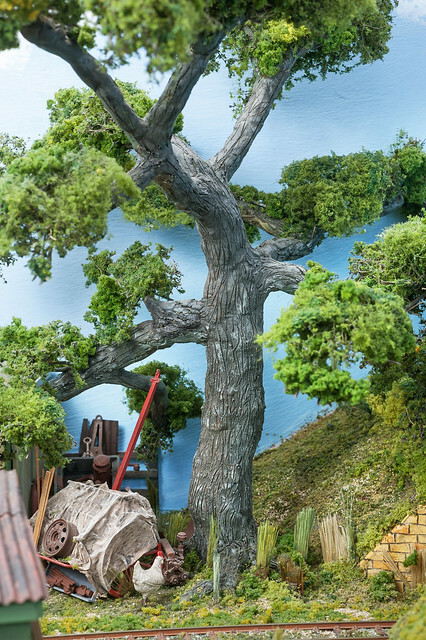 The photographs were taken on my HO scale switching layout. 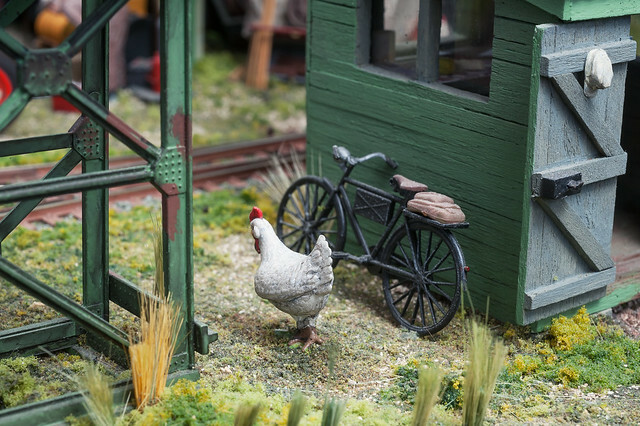 Certainly a very interesting and well detailed model. 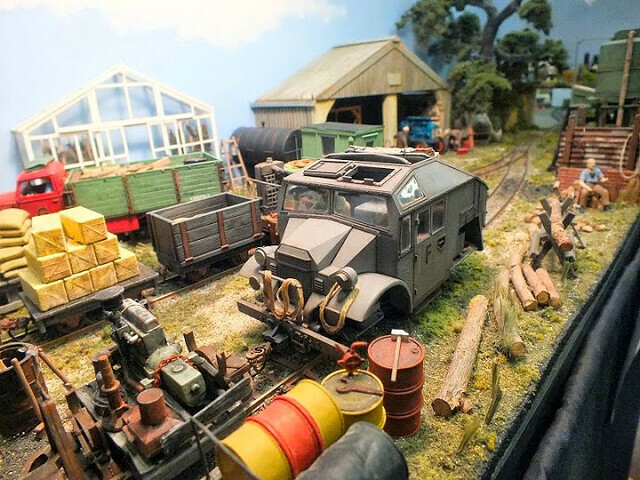 After seeing a video on you tube of real versions of your motive power, just one question where is the Dodgy Brothers passenger coach for the trucks to haul? 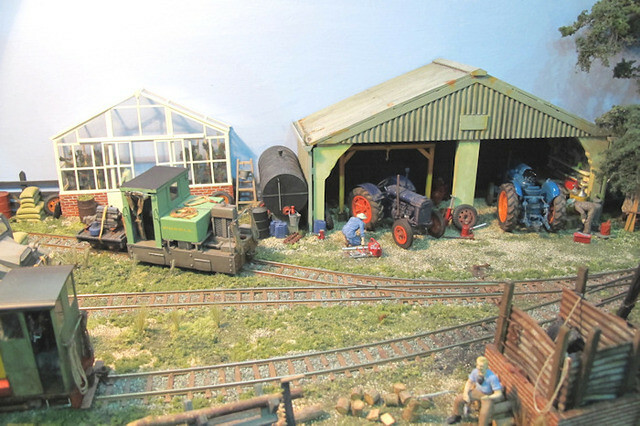 Any expansion plans for this one? 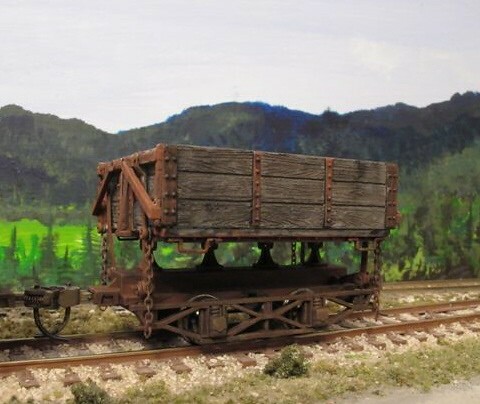 The porter and tippers look OK to me. 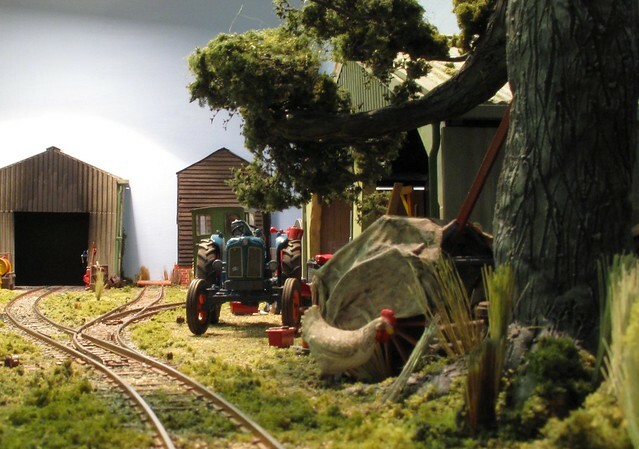 No I have no plans to extend the layout. 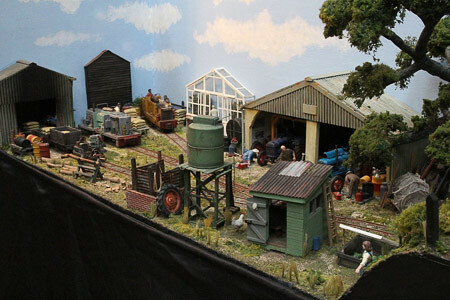 Being small I can often fill a spare corner at an exhibition. 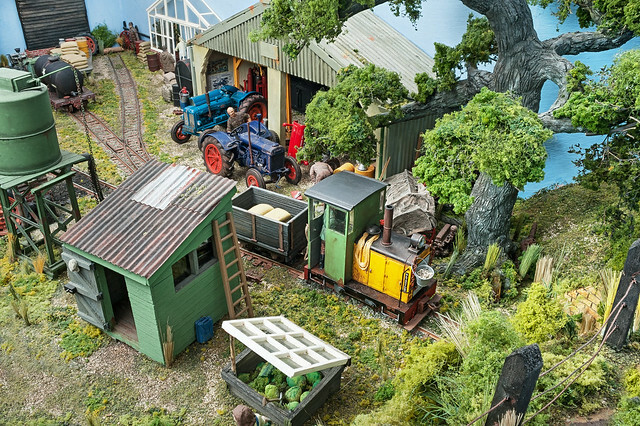 Also it shows you don't need loads of space to have a model railway. 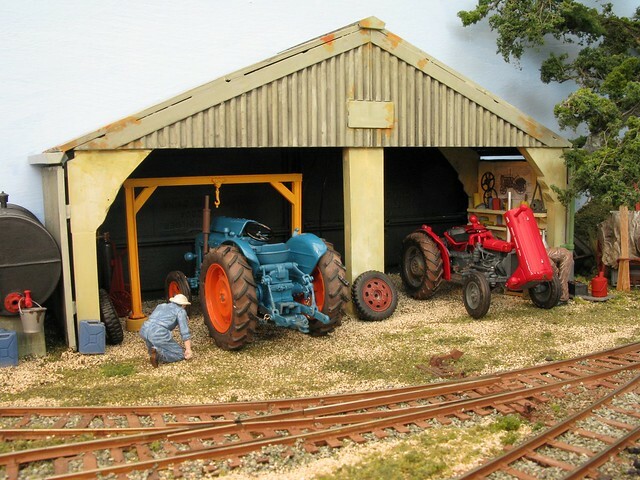 It is surprising how many people really think you need a small aircraft hanger to build a decent model railway so valid point. 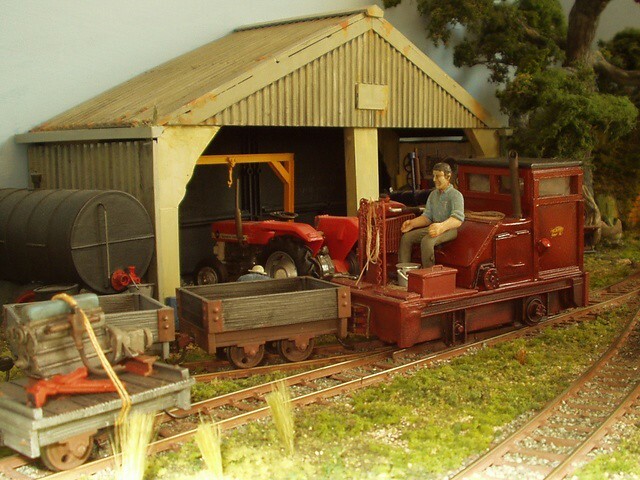 Me My OO layout is 4'6" square the 1/80 Japanese narrow gauge one is somewhere around 40cm X50cm and uses not much more track than came in the 1960's Jouef/Eggerbahn train sets which is where the track for that one came from. 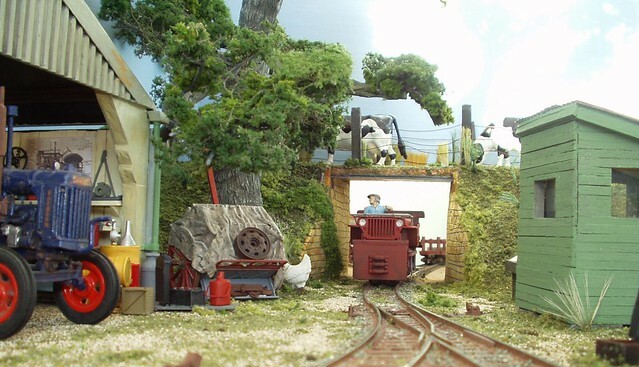 I do have a frame for a much larger narrow gauge layout done but have been distracted by other modeling projects. 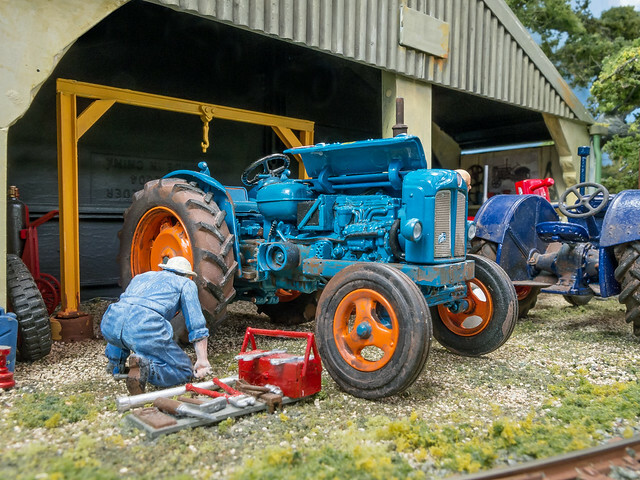 Just make sure the natural law of model railways doesn't start to exert its self to much. 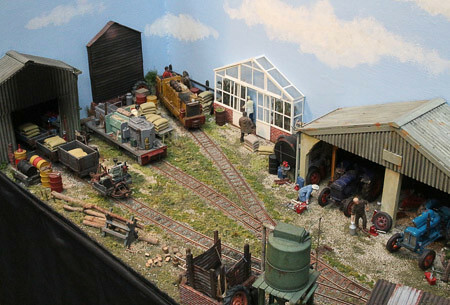 You are quite right John there are no cats on the layout. 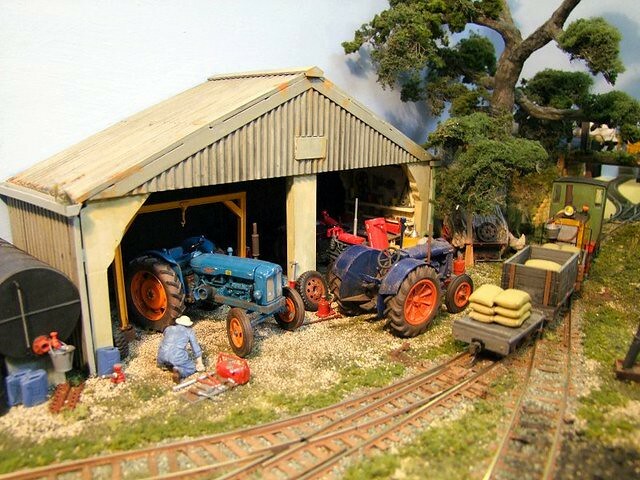 Despite searching over the years i have never found any in this scale. 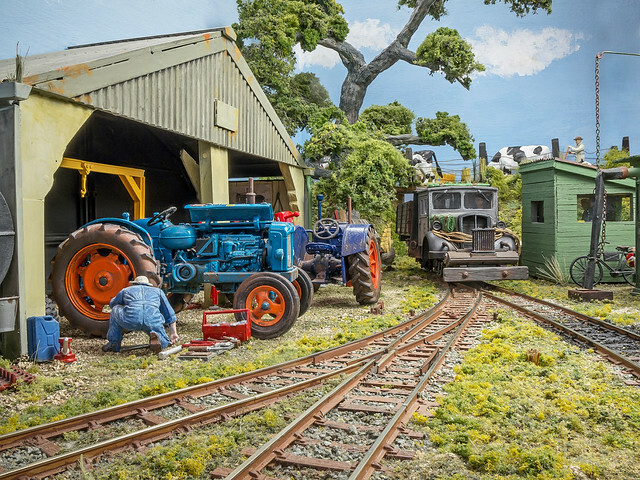 It's a pity because you can get bigger and smaller ones but nothing in 1/32 scale. 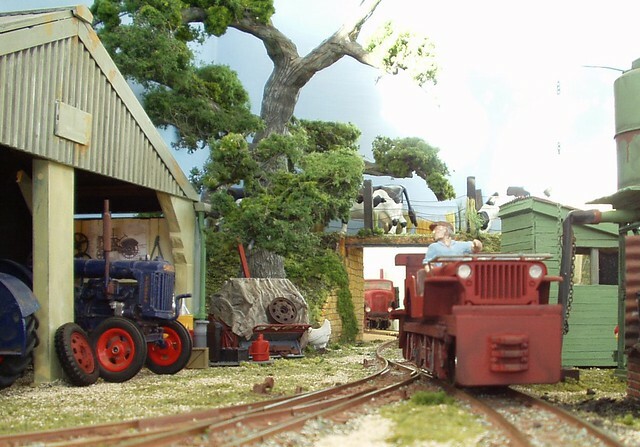 Franco, the reason I used four wheel bogies at each end under the truck bodies is to provide extra braking none of the stock has brakes. 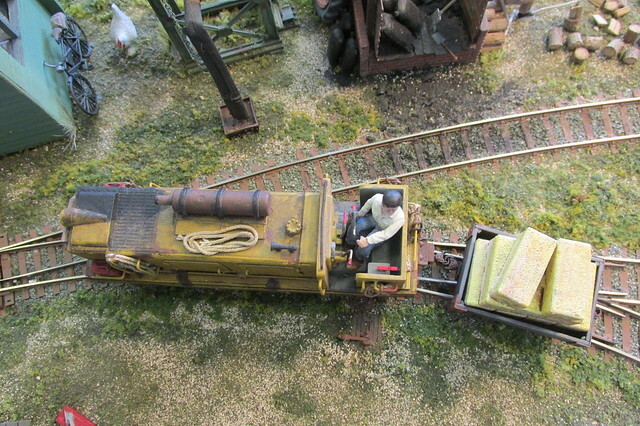 That is my excuse for using switcher chassis, and I'm sticking to it. 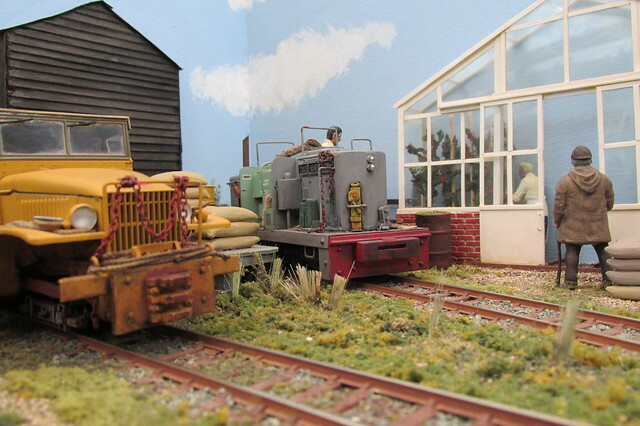 I will have a look for some cats as the layout was named after our two cats who are sisters. Sadly we only have one now and she is nearly 16 years old. 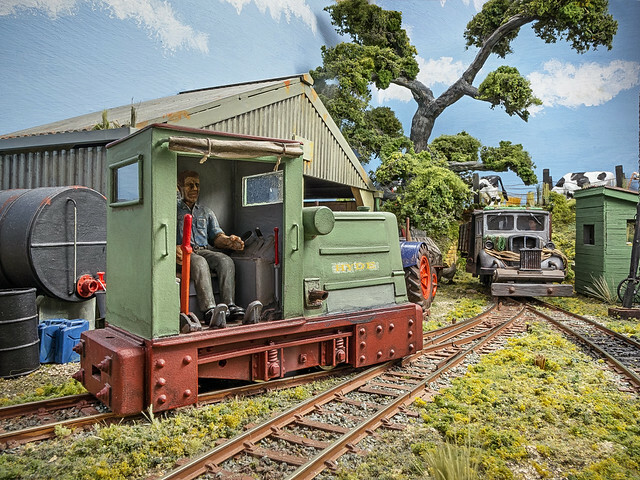 Making her debut on Sunday at Barton le Cley exhibition, this is Tilly, the latest addition to the farm’s growing fleet of unusual vehicles. 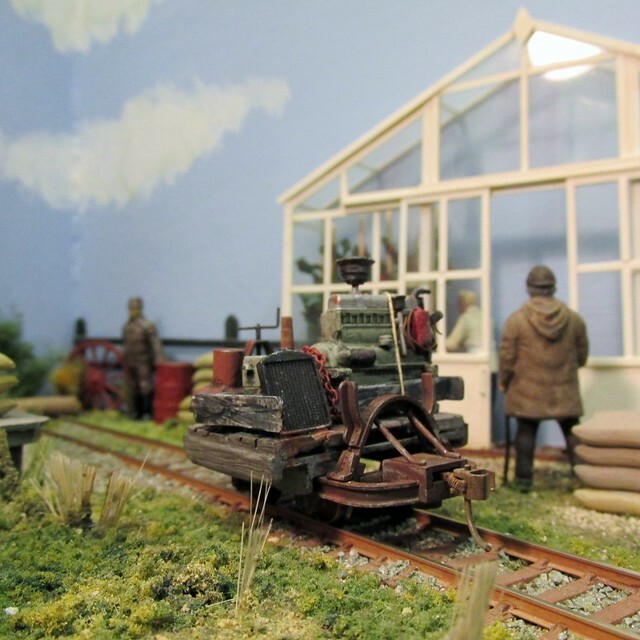 It is an ex Second World War 10 HP light utility car with a pick up body. 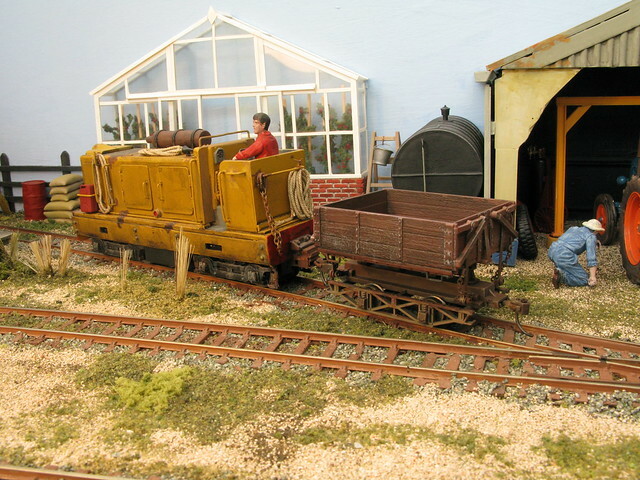 She is used for track maintenance purposes only and not general haulage. 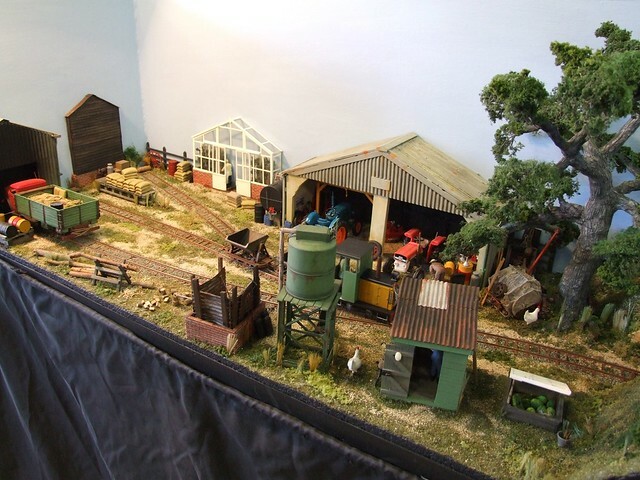 The kit was made by Tamiya and is rather delicate with the clear parts being a poor fit. 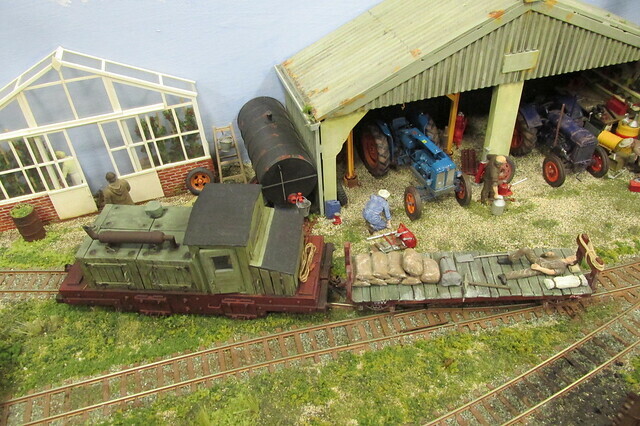 I have left the bonnet off to show the details in the engine bay, as it seemed a pity to hide them. 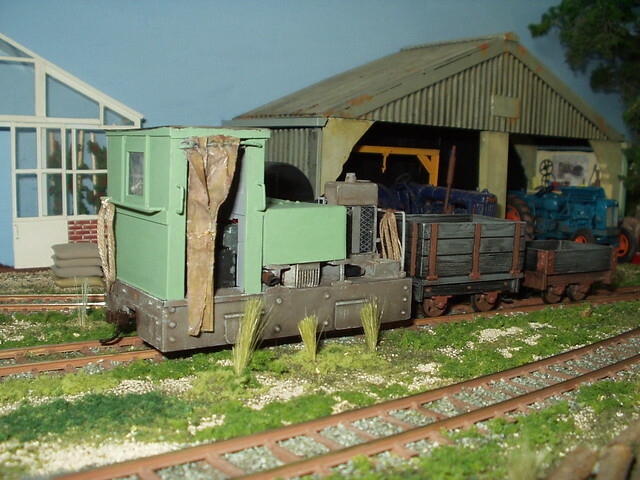 I made a false chassis to attach and locate the body to the power unit which is from an HO Bachmann HI-rail track maintenance van. 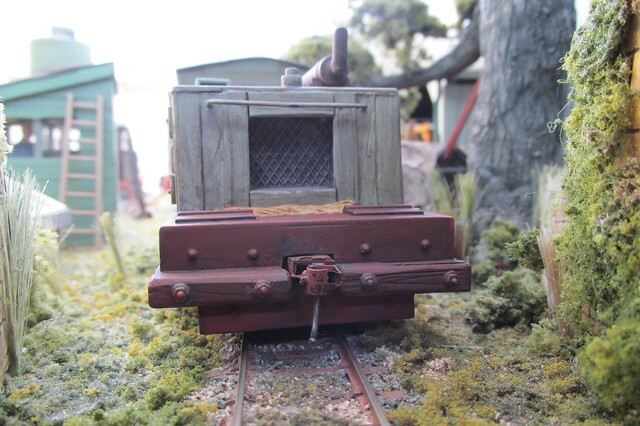 The body has a solid block of plasticard at the back of the false chassis which was drilled and tapped. One long screw then holds the two together. It has little out rider wheels which also pick up current. I added extra weight in any place I could to help it track better. 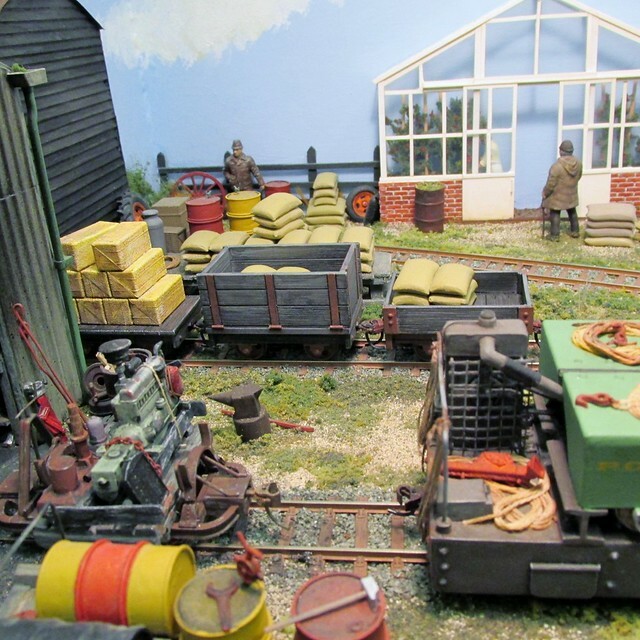 Andy Knott my fellow operator took a few photos on Sunday at the Barton Le Cley exhibition. 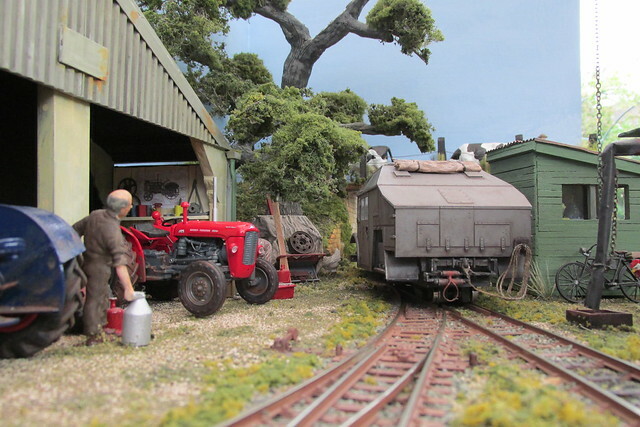 The is of the new track maintenance vehicle arriving back in the yard having spent the day adding sidings from the main line into the fields ready for the potato harvest. The model runs much better than I thought it would. 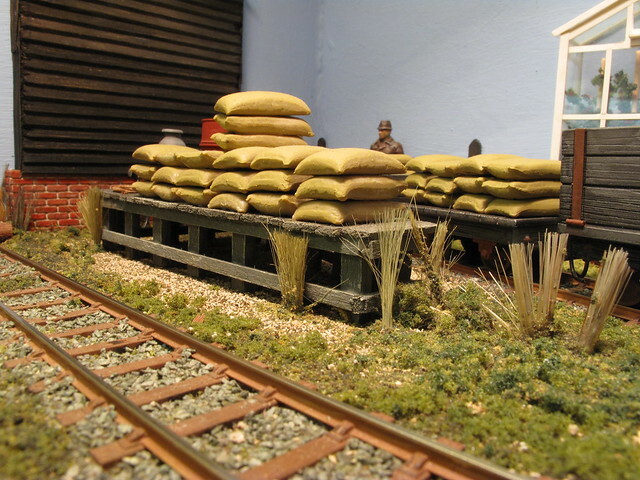 The other shows the Simplex at rest during a lunch break. 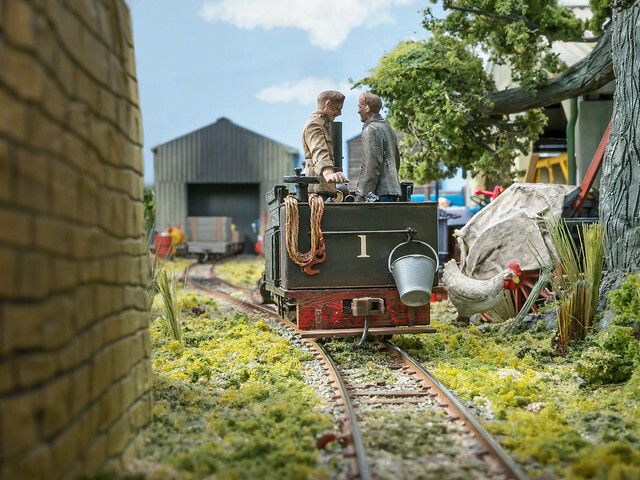 Mick Thornton, a photographer well known in narrow gauge modelling circles has very kindly sent me some excellent photographs he took at Barton le Clay. I know he is not very pleased with them but I’m sure you will agree, they look fine. 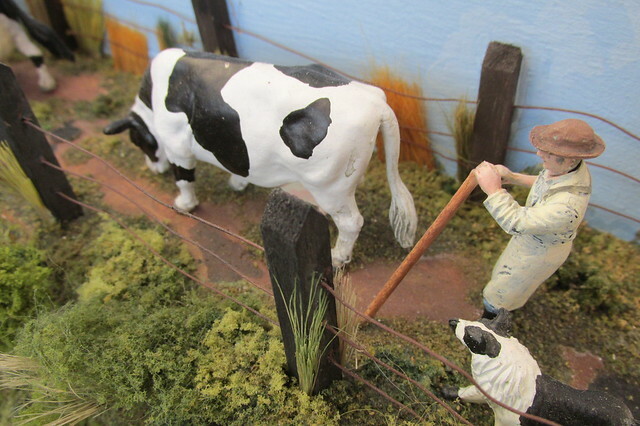 They illustrate a typical busy day in Two Sister’s Farm yard. 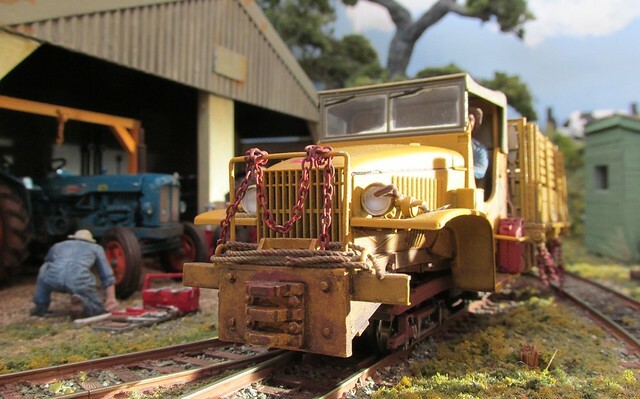 The Fordson Major 27n powered rail truck is the latest device to have come out of the farm workshop. 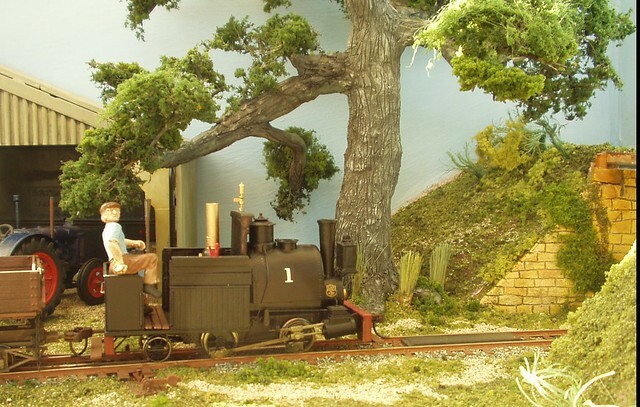 It is very loosely based on a device made by Muir Hill that provided the inspiration to build a similar device for my Two Sister‘s Farm layout. 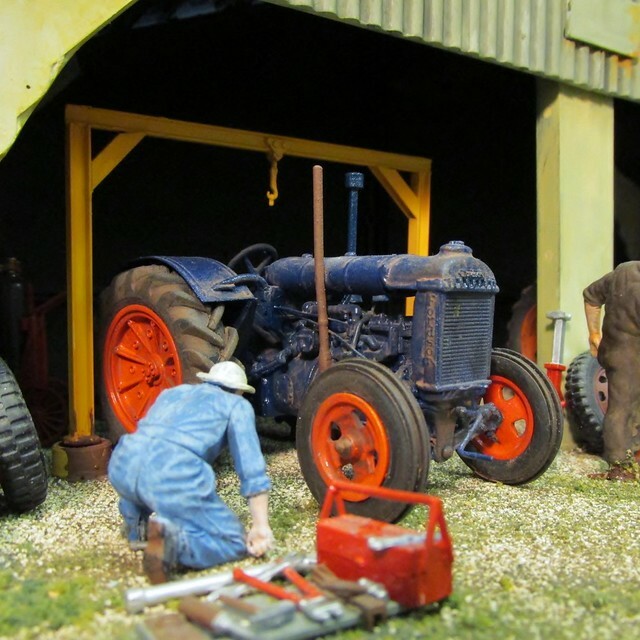 I was given a damaged 1/32 scale white metal Fordson and having a photo of the Muir Hill device decided it would be an excellent starting point. 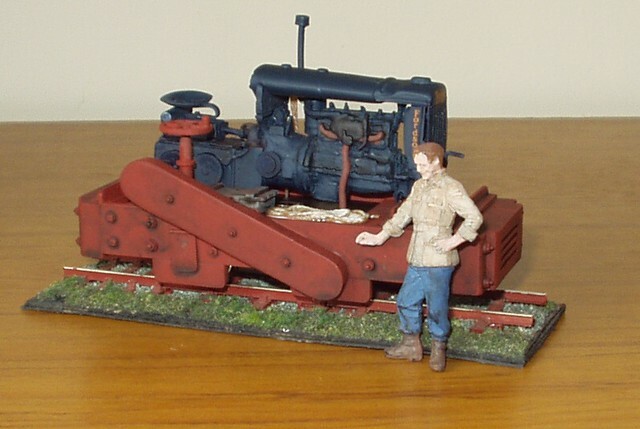 The model is powered by a WB35 Tenshodo bogie. 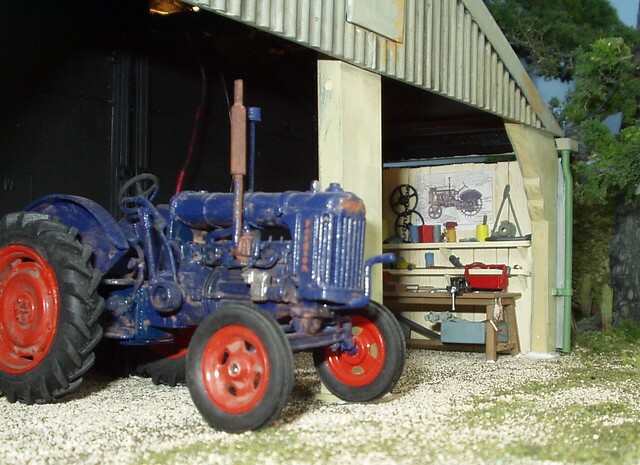 This is held by one screw to a plasticard false chassis which in turn is held by two screws to the plasticard chassis that supports the white metal tractor body. 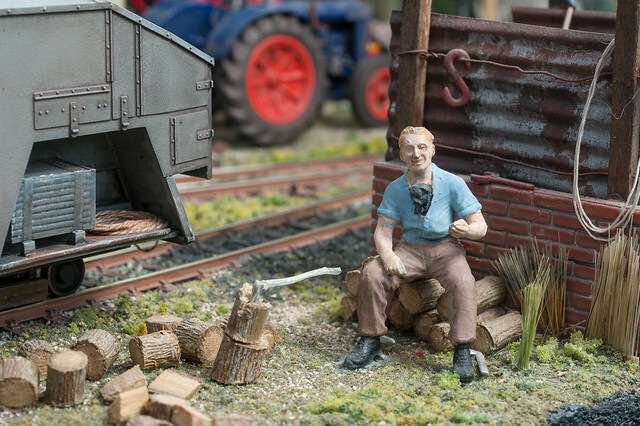 The driver figure is a German tank crewman supposedly playing cards from Master Box. 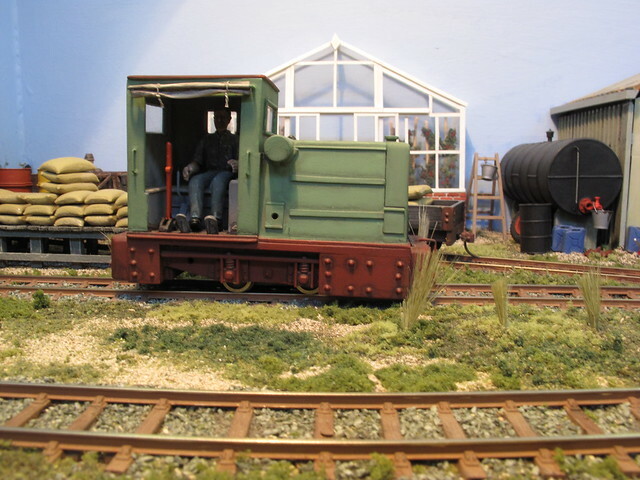 The finished model is much higher from the rail top than the Muir Hill example due to the space taken up by the Tenshodo bogie. 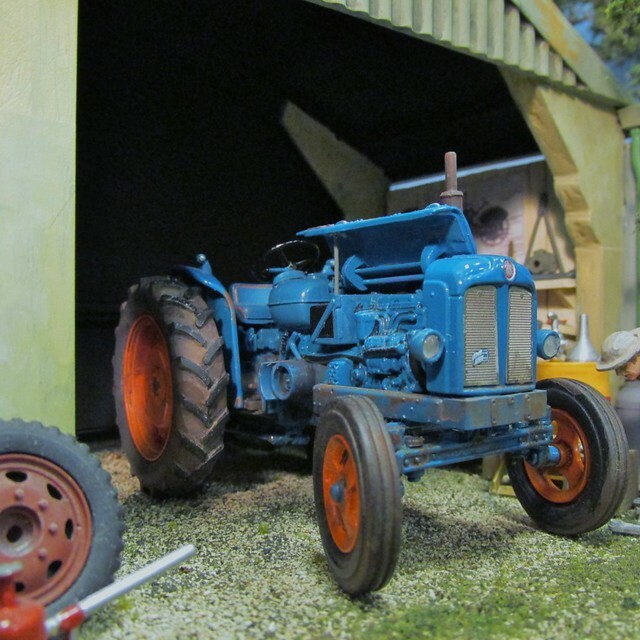 Therefore it is assumed an accident damaged tractor had a chassis built for it in the farm workshop. 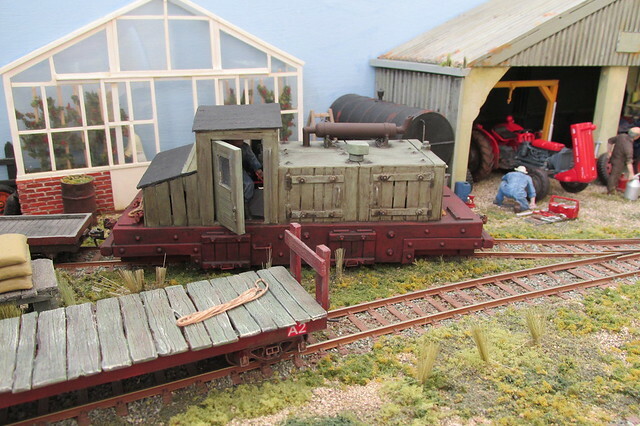 It is used for light shunting in the yard due to its relatively low power and its three speed gearbox. 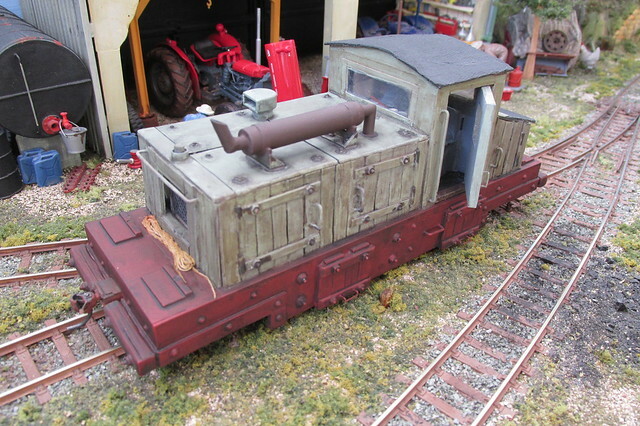 It still needs a little more work on the weathering, I find the photos helpful. 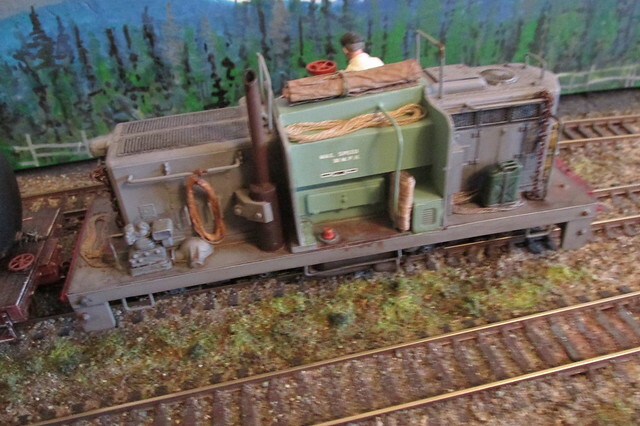 At the same time the tractor based device was being built I was working on another rail truck. 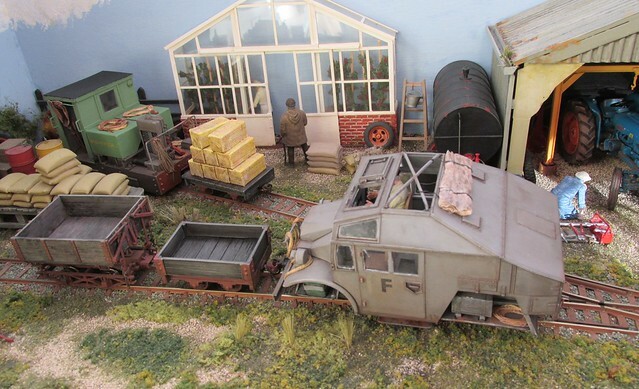 This has a Zvezda GAZ-AAA Russian 1/35 scale kit of a Ford based lorry as a basis. 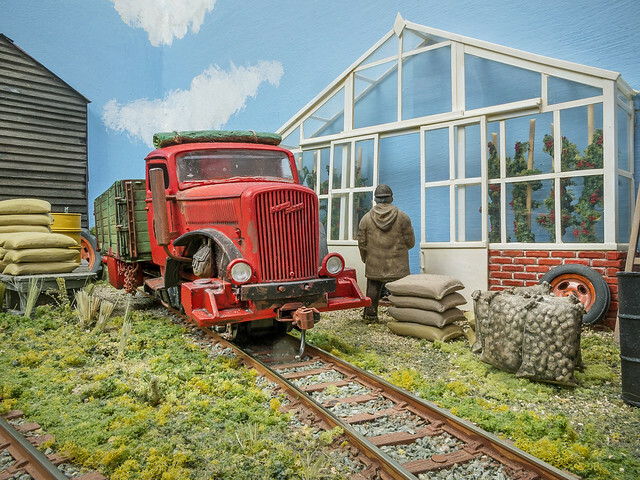 The real trucks were built under license in Russia during the second World war. 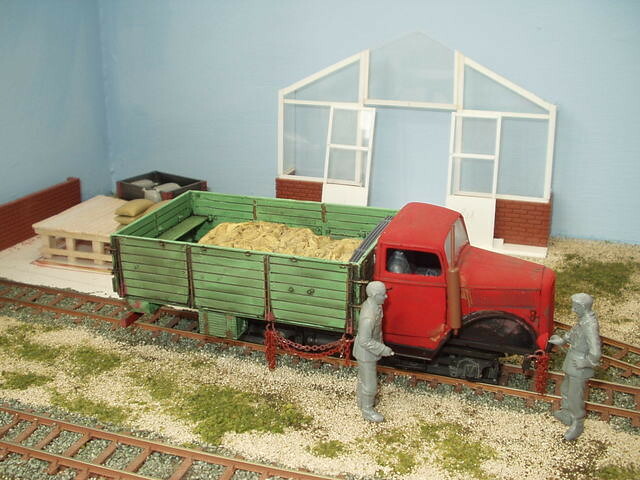 Because the prototype is a small vehicle I used the three axle truck to give a little more length, the two axle version being very short. I must admit I am a little disappointed with the way this has turned out. It has one saving grace however, it runs superbly and I’m happy to make allowances for decent running. 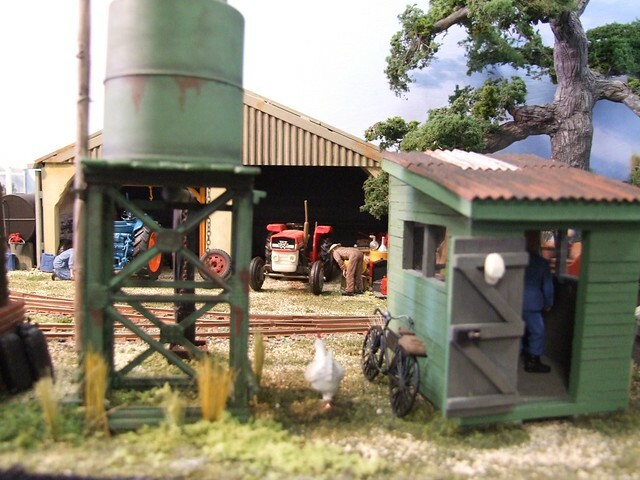 The kit was inexpensive and turned out to be rather poor with regard to the fit and quality of many parts. 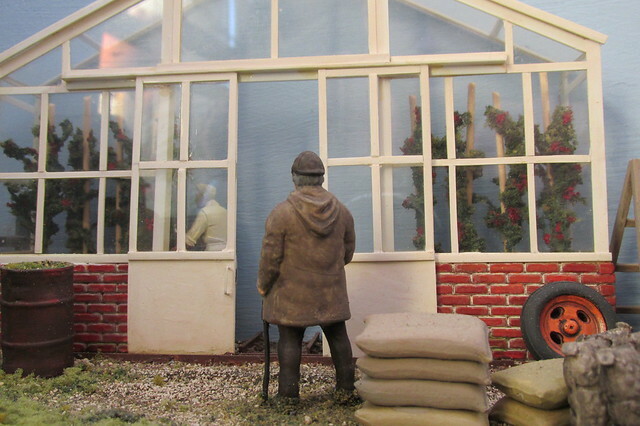 The clear plastic windows being especially troublesome. 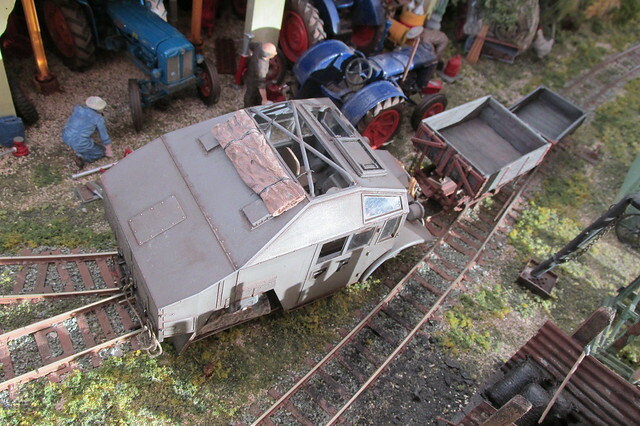 But with a lot of fiddling and cutting I eventually managed to get it to fit a Con-Cor switcher chassis. 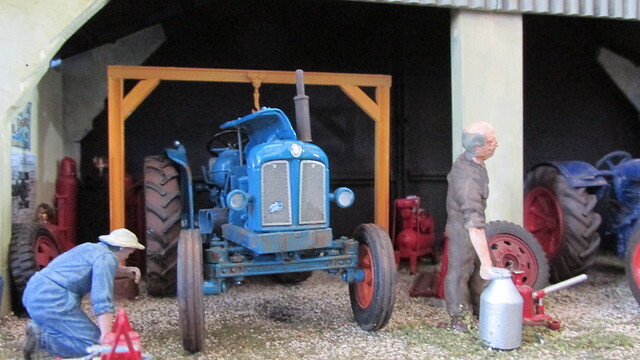 It is a kerosene tanker for refuelling the tractors out in the fields. 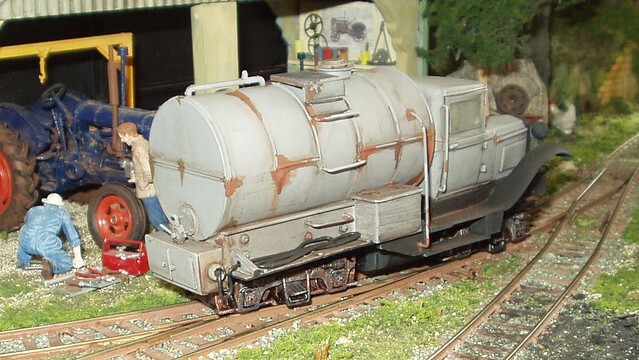 The tank is actually an HO scale Walthers Oil Terminal item I have modified to suit its new role. 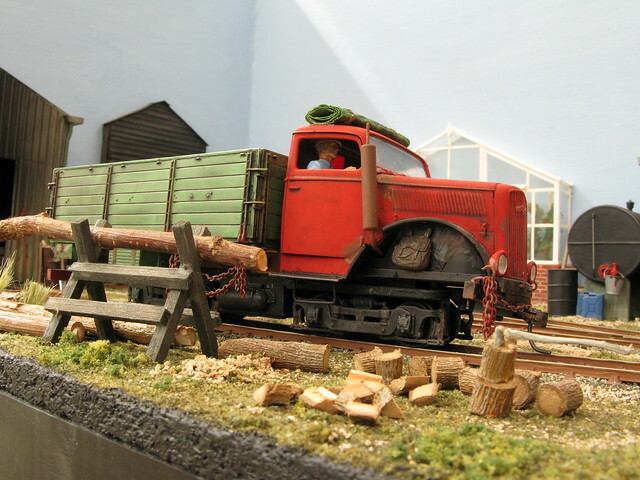 I added flat shelves to the body sides to hold the refuelling pipes and a couple of wooden boxes for tools. 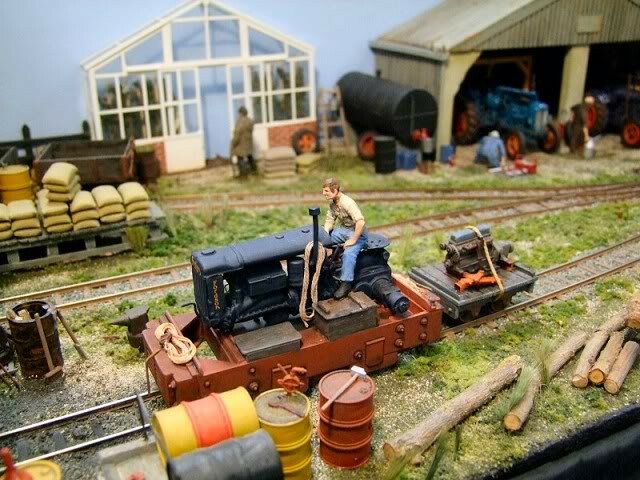 The hand rails are made from paper clips and the rubber refuelling pipes are resin cored solder. The exhaust pipe and silencer I have moved and now is fitted to the front of the vehicle to minimise the fire risk. 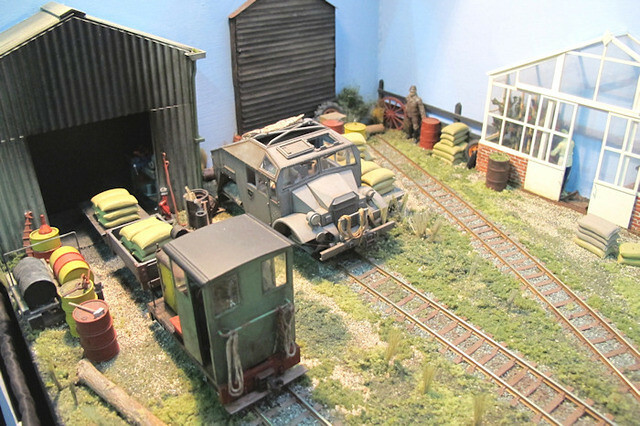 I had another exhibition at Stowmarket in a couple of weeks time so I set the layout up to check clearances and the running of the Fordson rail truck. 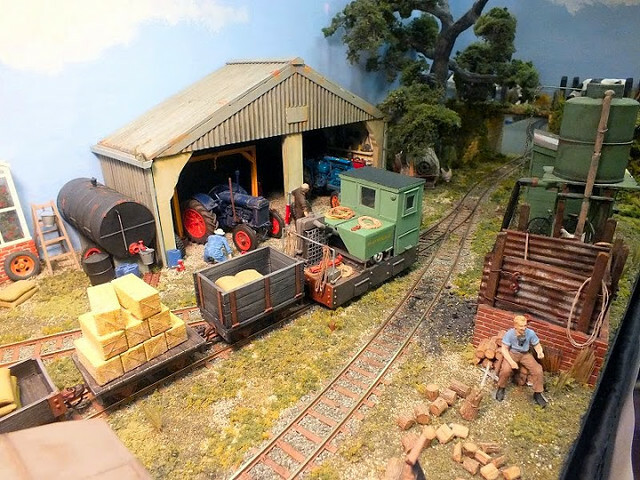 The controller I use on Two Sister’s Farm gives slightly slower running than a similar model on the switching layout I used for testing the machine originally. 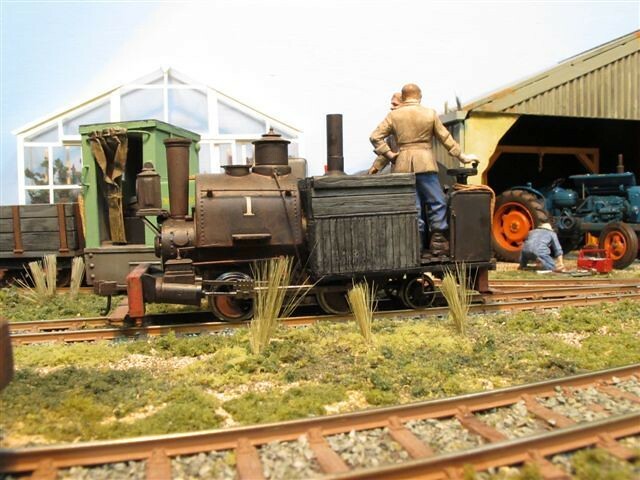 I am pleased to say it runs very slowly and smoothly if a little noisily. I think this is due to the feedback controller. I have added a few more bits dusted it over with chalks. 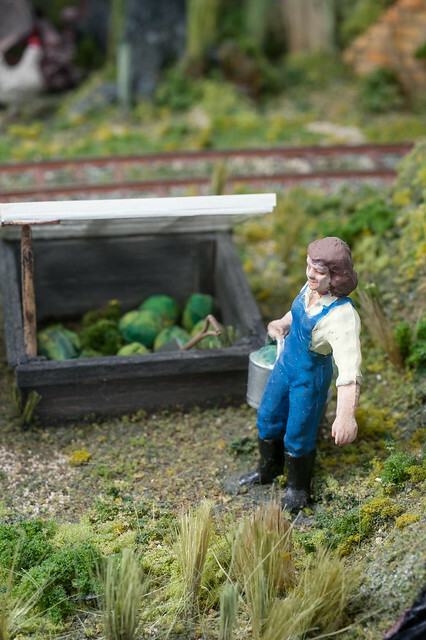 I wanted to see what it looked like in an agricultural setting. I think the flash used in the photos make the driver look a little paler than he really is. In fact it probably makes all the colours look a little lighter than they are in the flesh. 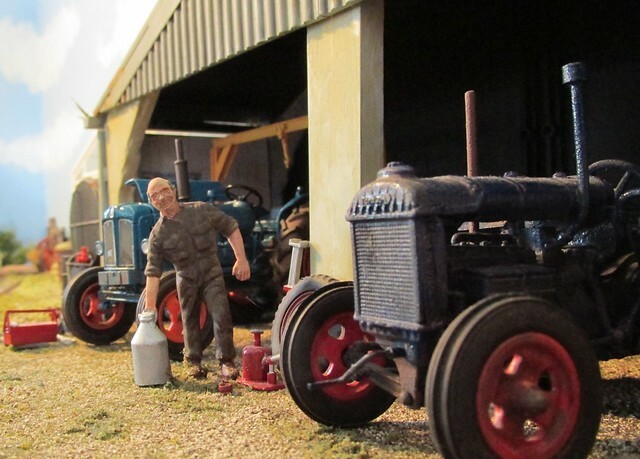 Andy my ever reliable helper took a few photos while we were at the Rushden show this weekend. 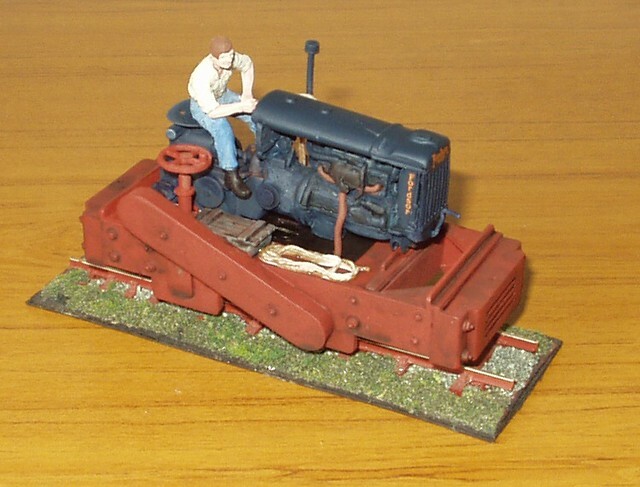 They serve to illustrate a couple of minor additions I have made to the Fordson rail tractor. They are the addition a throttle control rod to the carburettor and a control rod to the magneto for the advance retard device. 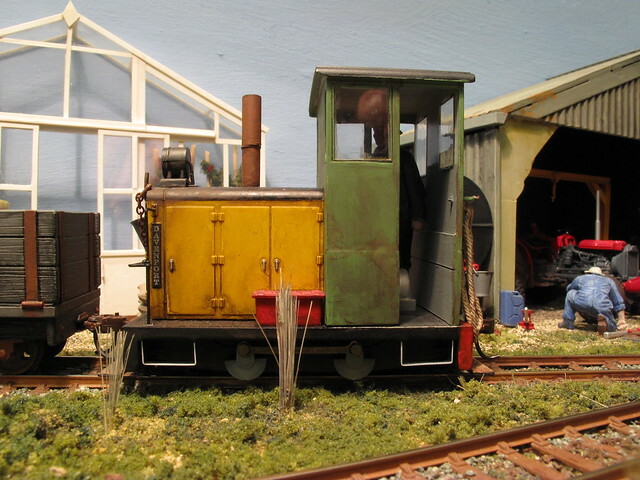 The Porter has had the high bulkhead between the footplate and the boiler removed which has I think improved its appearance. 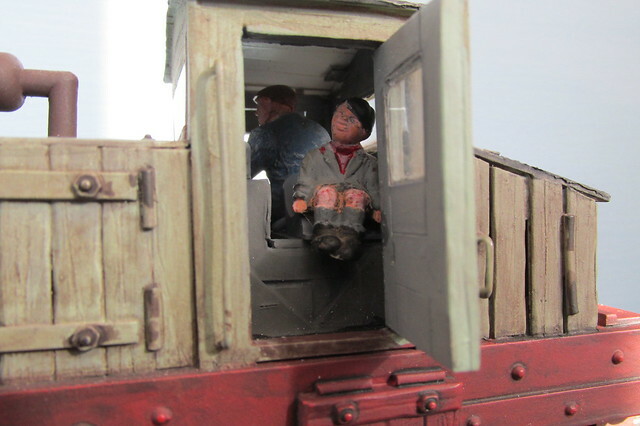 Another figure has been added as company for the driver. 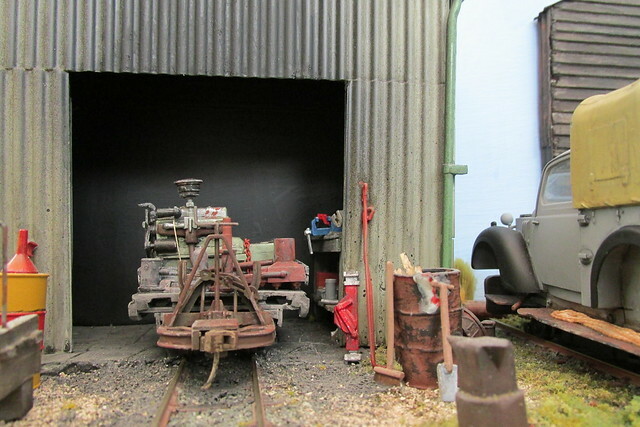 The last photo shows the Simplex type machine at rest in the yard. I am always pleasantly surprised how well this runs given its humble origins. 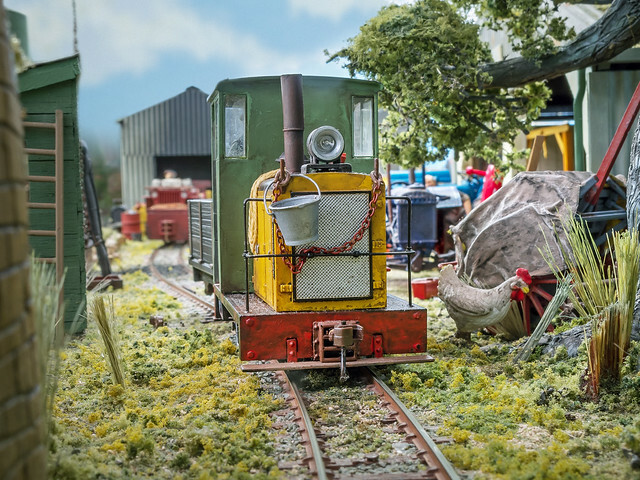 Some pictures taken at Spalding a couple of weeks ago by the organising club’s official photographer. 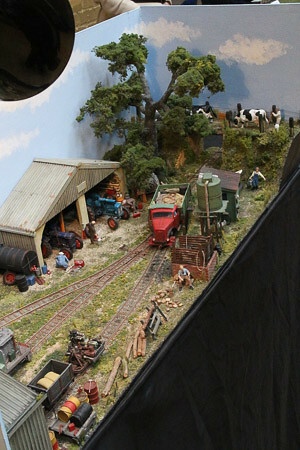 They are a bit different from the ones usually posted as they show what the layout looks like to the paying public. I did a two day show at Reading last October and on the Sunday when things quietened down in the late afternoon I had a wander round. I found on the organising club’s stand a box of mixed figures all in different scales. 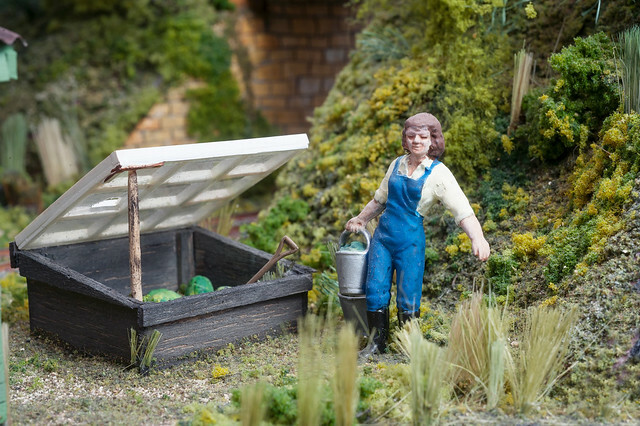 I bought two 1/32 scale figures for 50 pence. They were un-painted and made of a hard white plastic. They both had thick bases and quite a lot of flash. After a lot of work with a scalpel and various files they have cleaned up quite well. I have no idea who made them as I wouldn’t mind getting some more. 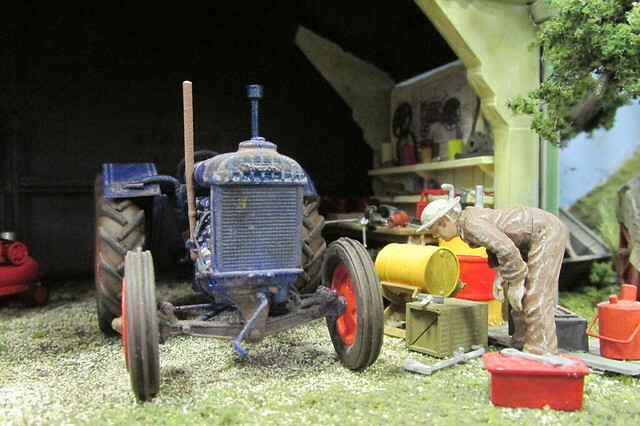 The mechanic in grubby brown overalls with fuel can. 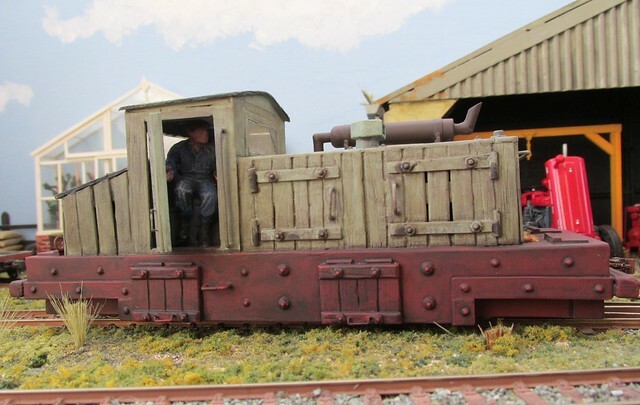 has just cadged a lift on one of the freelance shunters. 2013 has not been a good year for electronic devices for me. Firstly my old computer died after some eight years use and now my wife's compact camera has cried enough also. Although it has taken many images over the last thirteen years so I shouldn't complain really. I have never owned a digital camera, I always borrowed the one belonging to my wife in the past. With that no longer working I have had to lash out on a device of my own. 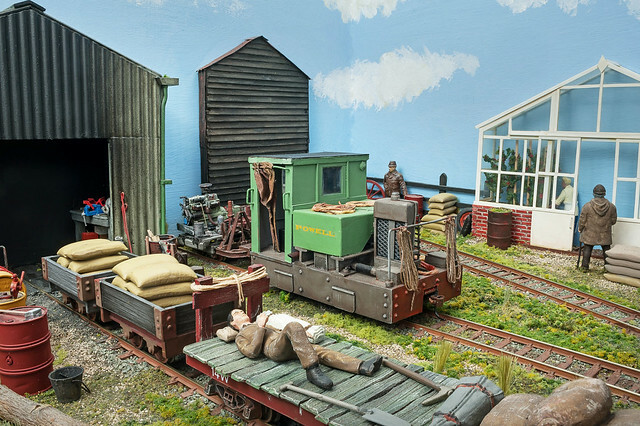 These are a few images I have taken with the new camera while testing the layout and stock in readiness for Swanley and Braunstone the week after. I must admit I am very pleased with the Camera it is a compact Canon and was on offer at half price. Its performance when used for close ups seems especially good. The image files are very large and I was concerned about reducing them so that I could post the photographs. So here are a few more. 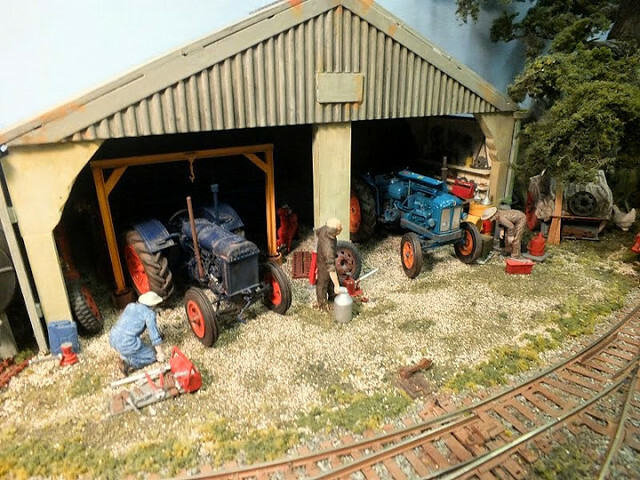 The men outside the workshop put me in mind of a formula one team waiting for their car to pit for tyres and re-fuelling. 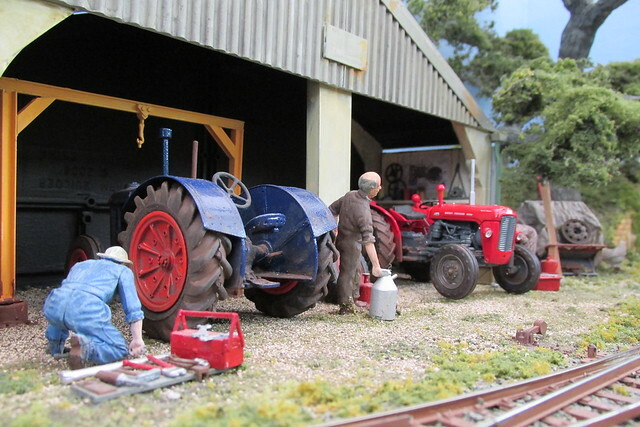 The men now have something to do checking over the two tractors before they set off for a days work. 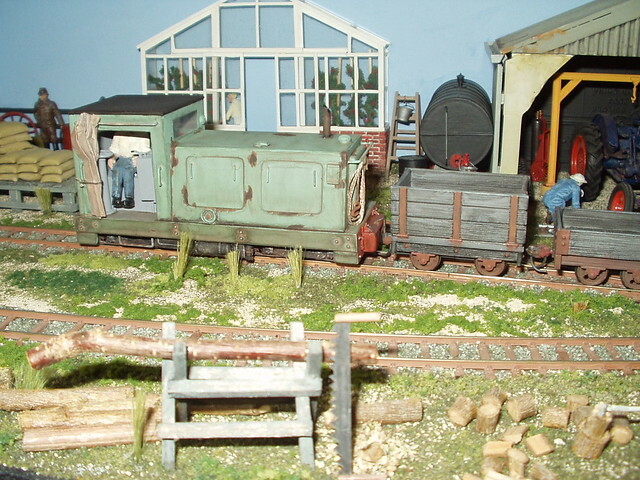 A Bachmann V tipper chassis and a rudimentary wooden body made of plasticard with an engine and other items piled on it to be repaired in the workshop. 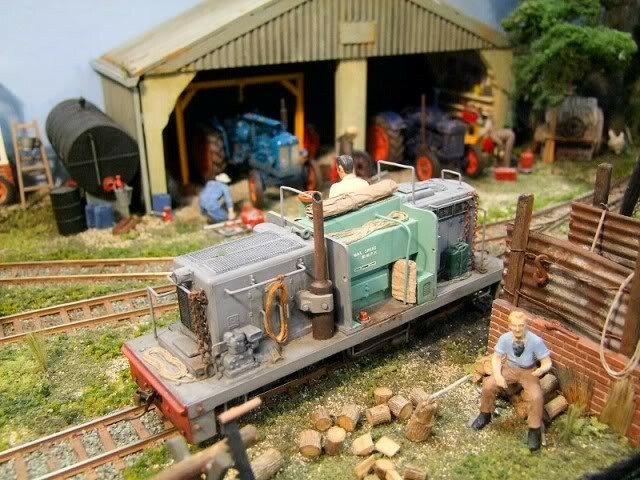 It's Sunday morning and a quiet period in the yard, with the wooden bodied Simplex and Tilly resting between assignments. I have reset the camera to a lower quality setting, this means I can get more images on the memory card. The only thing I'm not too keen on is the instruction manual which is on disc and not hard copy, but then I am very old fashioned and I was a printer in my working life. 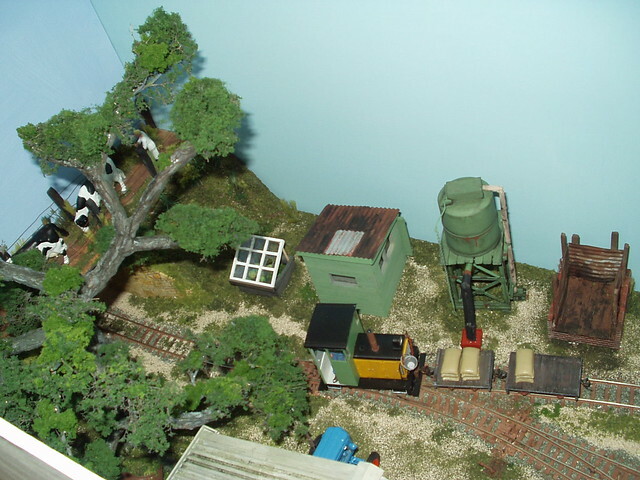 The quality is very nearly as good from a posting pictures point of view as can be seen from the following pictures. As is often the way, while searching for something else I have found a CD with a few pictures taken at the second exhibition I did with Two Sisters way back in 2008. 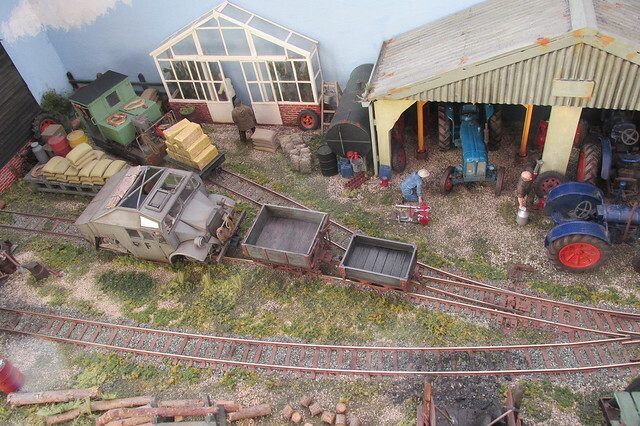 I was on my own and a friend operated the layout while I had a quick sandwich. 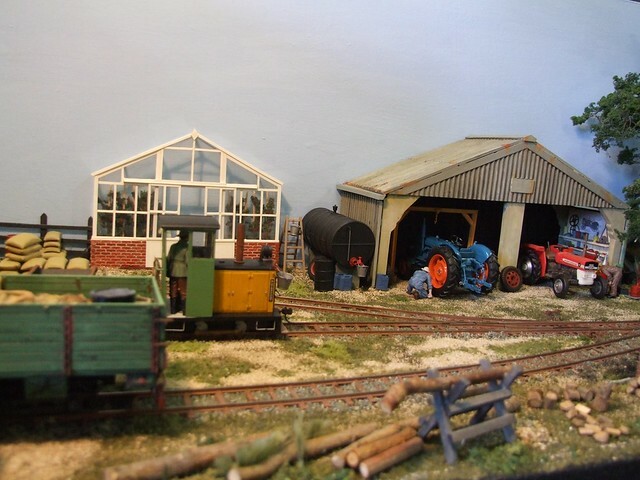 The photographs were taken whilst I was not there by someone I think called Neil Ripley. 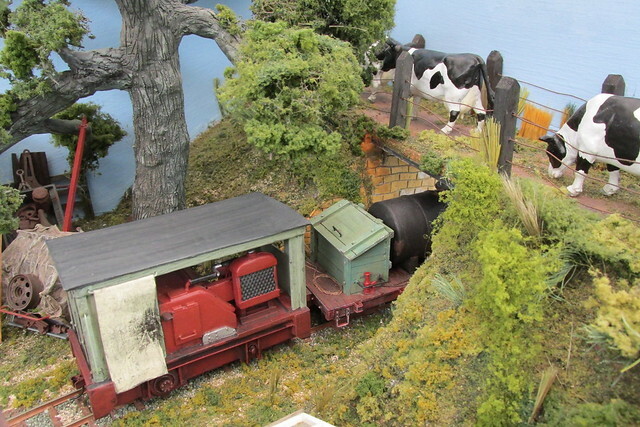 As you can see I had less variety of forms of motive power in those far off days. 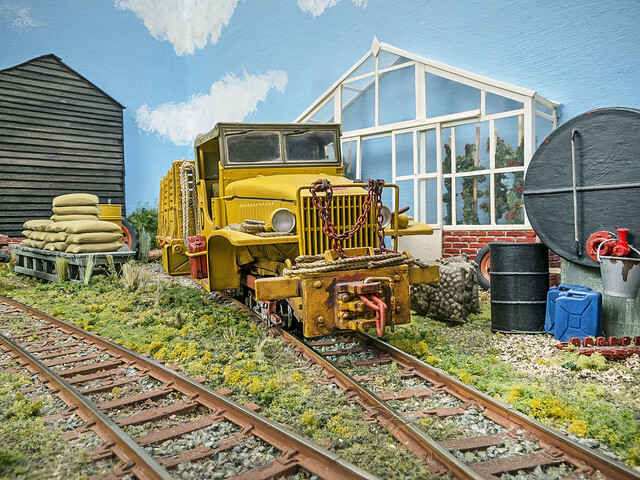 Some pictures taken by David Pennington at ExpoNG exhibition at Swanley. David has kindly given me permission to post them. 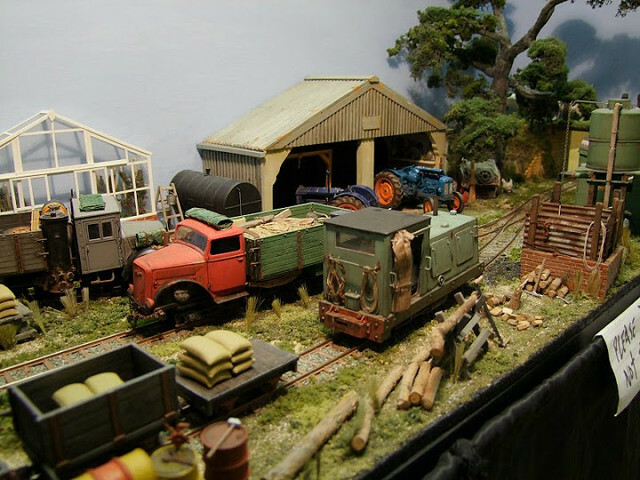 A few pictures taken at the Beds and Bucks open day Exhibition on Sunday 26th January. 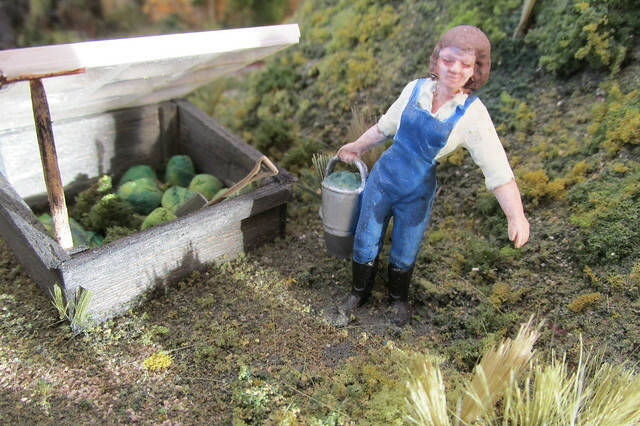 A few pictures I took of Two Sister's at the exhibition in Stow on the Wold. 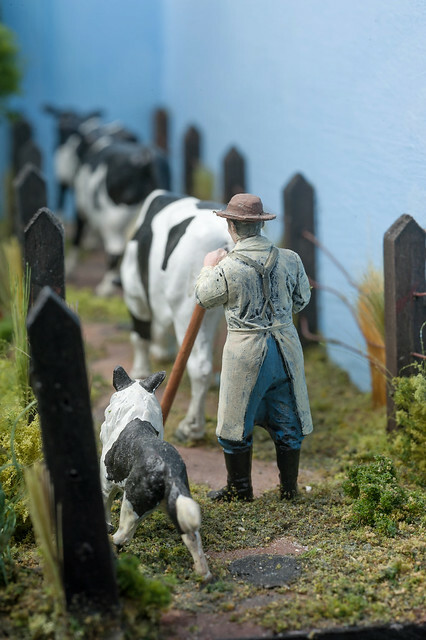 It is a fabulous venue in a charming Cotswold town. 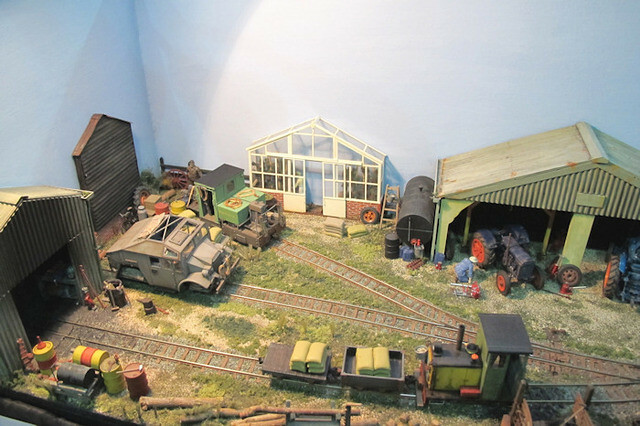 The show was very well attended by a record crowd, despite the glorious weather outside. 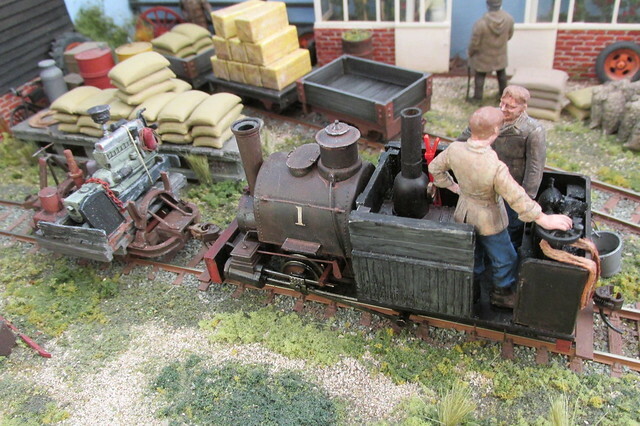 I have now fully Anglicised the little Porter and took a few pictures recently of it at work in the yard. 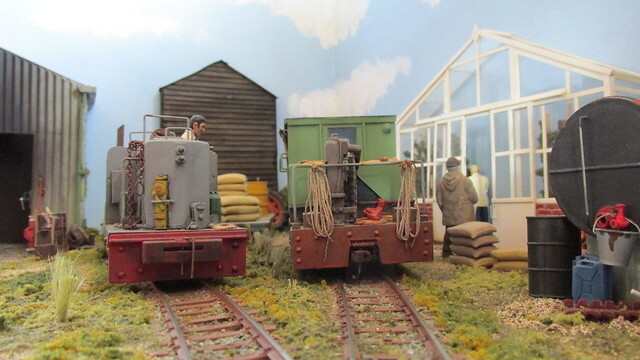 Whilst checking the layout over I was ably assisted by one of the two sisters the layout is named after. 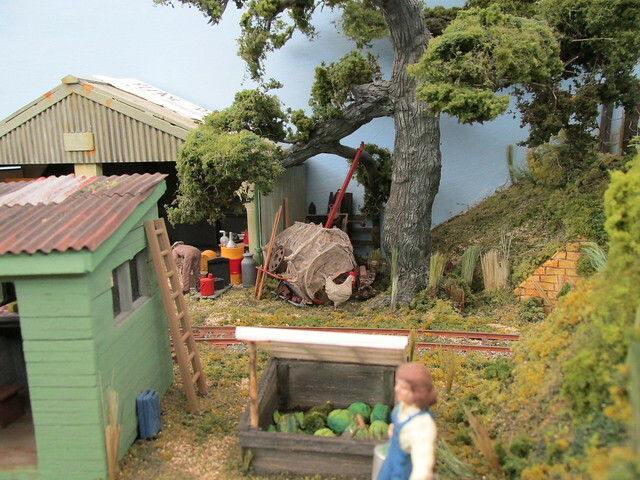 This is Amy who quickly got bored and went to sleep on the black bin liner that covers the fiddle yard and under the layout cover itself. 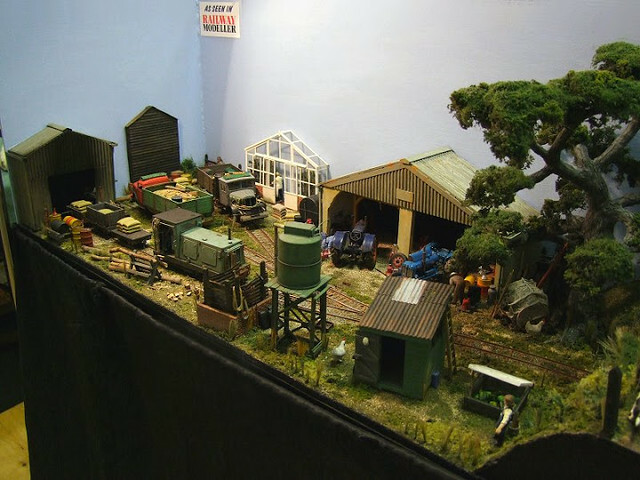 The real Nocton Estate for instance on its 7800 acres there was almost 23 miles of single track around the fields. 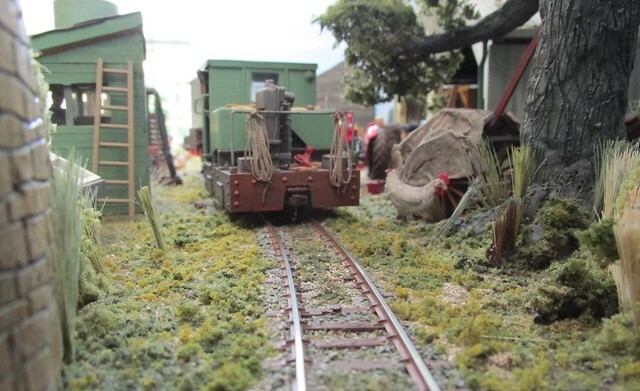 There was also track used for a large number of sidings and temporary track that brought the total to around 35 miles. 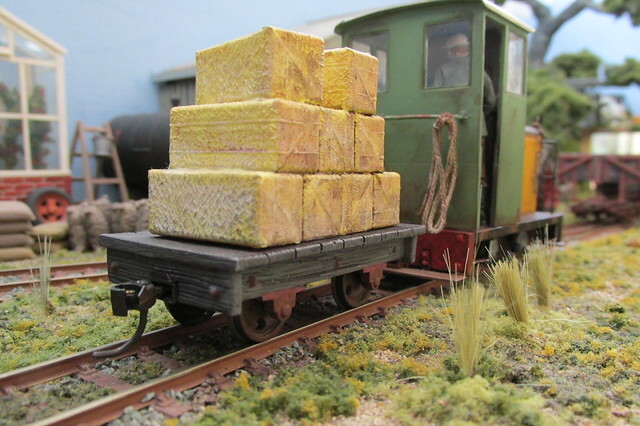 Some bales of hay which will be delivered to the extensive pig sties by the Davenport, on the Nocton estate a two foot gauge track ran down the centre of the pig sties. 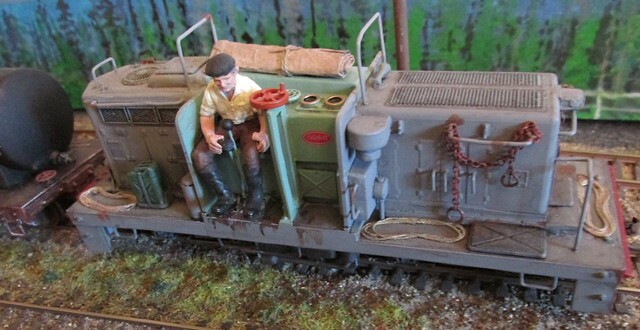 This modified Bachmann On30 loco although it only has four wheels runs superbly over the dead frog points. 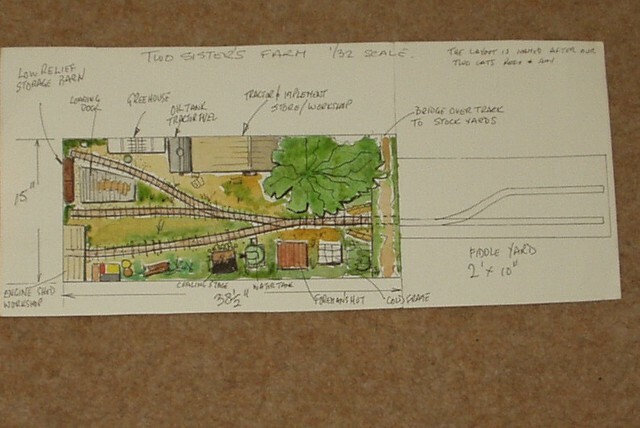 A rough plan of the yard showing the very simple track layout. 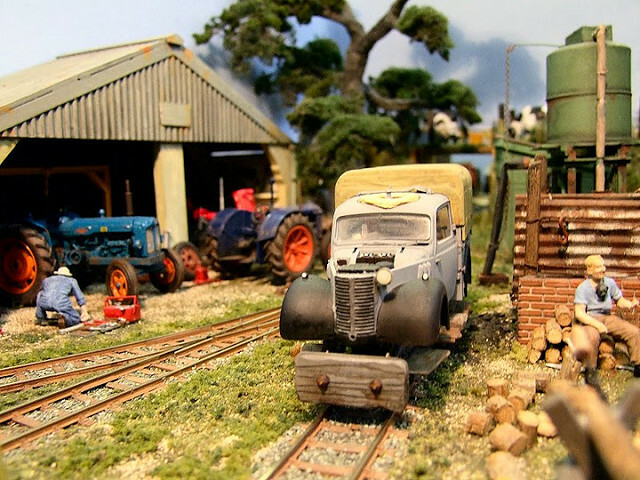 A view taken standing under the bridge as a Simplex rumbles towards the camera as it sets off for another day in the fields. A few more pictures I have found, taken when I first got the new camera and was testing it out. 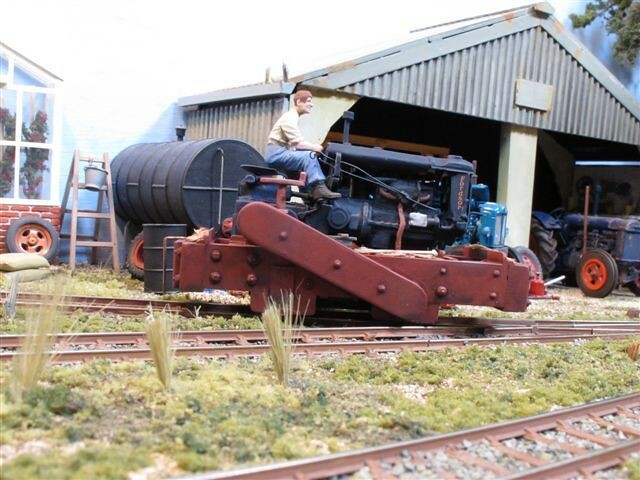 I was given a Concor switcher to use as power for one of my special shunters down on the farm. I decided to cheat with the wheel arrangement and call it a 2-4-2. 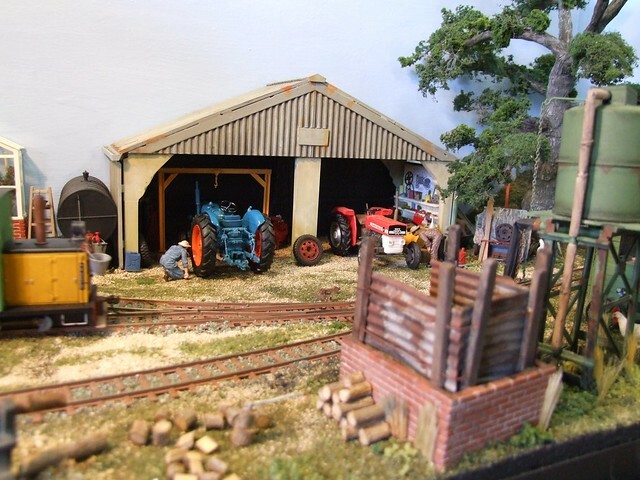 I fancied something built in the farm workshop so thought a wooden body would make a believable alternative to metal. 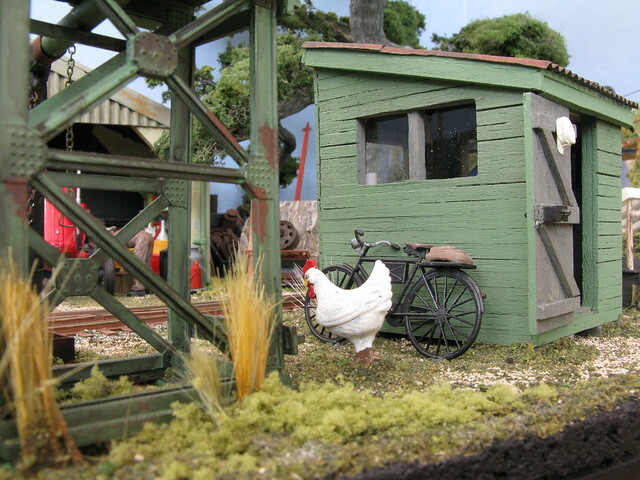 I have made it up as I've gone along and now it is finished I'm quite pleased with its rustic look. The doors actually open using vertical hinges in the door and frame. The holes in the frame at the bottom of the door were done using a hot pin heated in a blow torch. It was not possible to get my pin vise drill close enough to do the job. All a bit of a bodge but it worked. 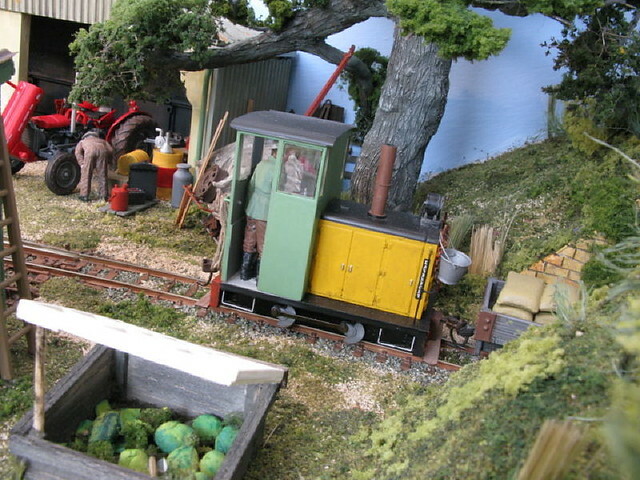 Here is a selection of pictures of the device in the yard at Two Sisters. 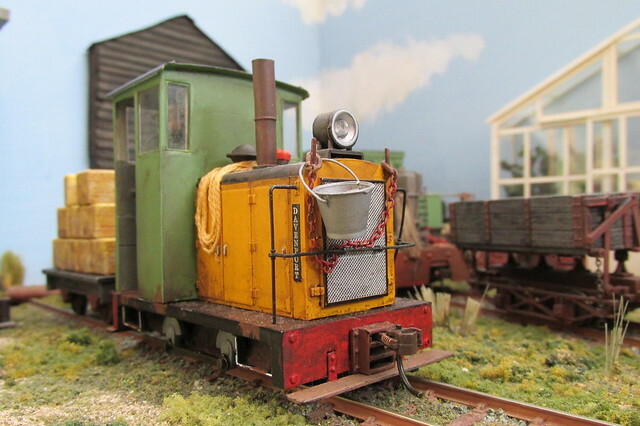 I was asked on another forum to take a few close ups of the wooden bodied Simplex, these only serve to show up its faults really. 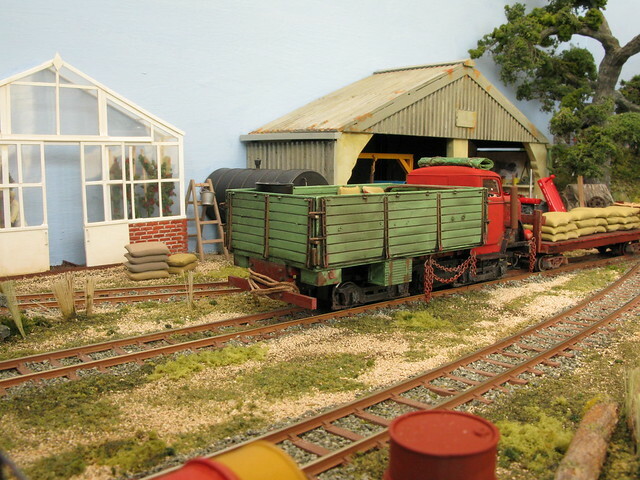 So I used the opportunity to clean the track and wheels of the locos and stock and generally test the layout ready for its next outing in April. I also thought it about time the driver, an ex commando had a change of shirt. 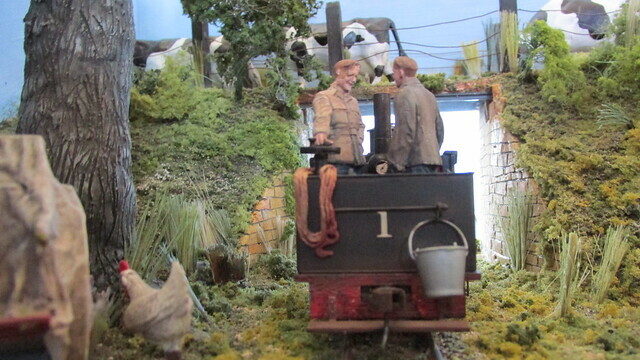 He has worn the other red one for at least five years so I have re-painted it a sort of off white colour. 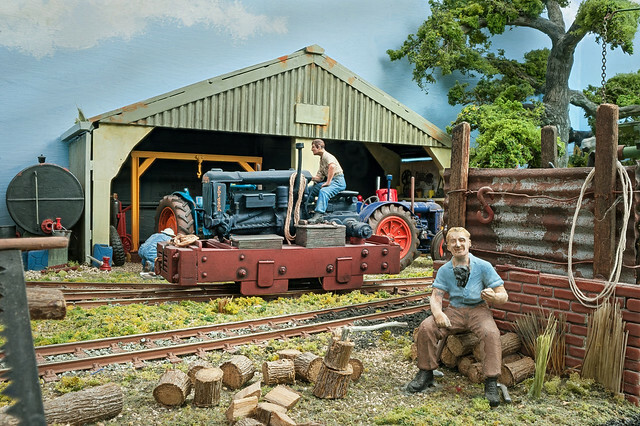 I had a wander round down the farm this morning and took a couple of pictures of the new shunter's crew. There are two of them the driver and his young son. 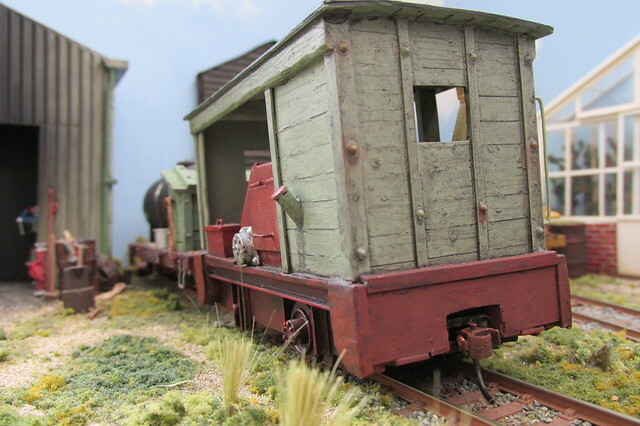 I can't run the loco with the doors fully open as there is not enough clearance with the bride supporting wall. 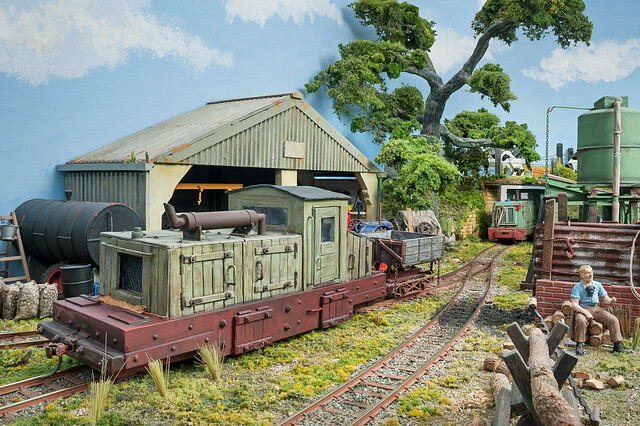 I can run with them slightly open though giving the onlooker a glimpse, it is the sort of thing children like to look at while at shows. 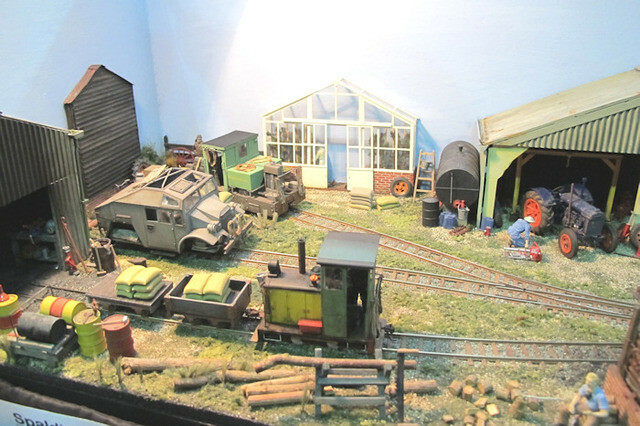 A few pictures taken at Beacon-Rail 2015 exhibition on 11th April, an enjoyable small show where we were sadly the only narrow gauge exhibit. 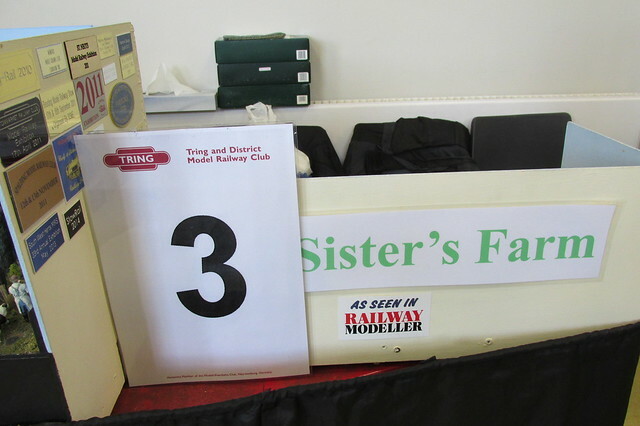 While exhibiting at Tring we gained another sister. I have been given a disc of photographs taken by my fellow operator Andy Knott some years ago, here are a few hopefully not seen before. 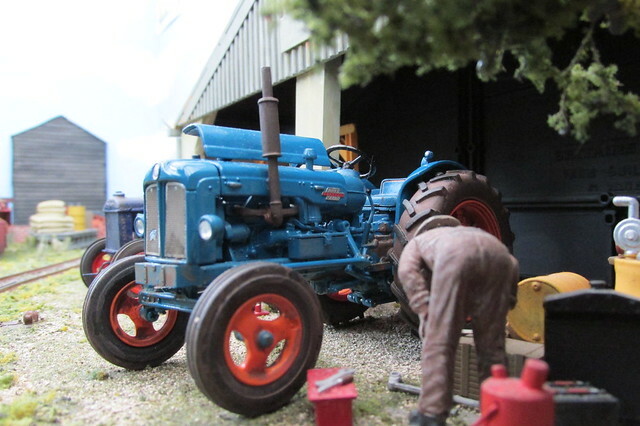 The Massey Ferguson 35x getting some attention, she is used mainly for light work around the yard. 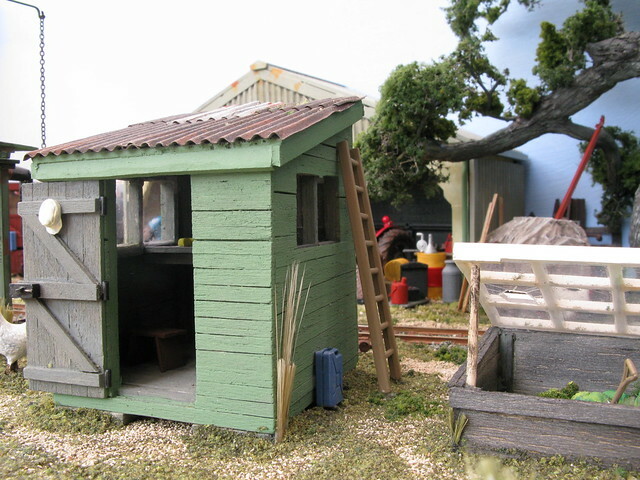 The yard foreman's hut is based on the ones we had at work, which have now been updated. 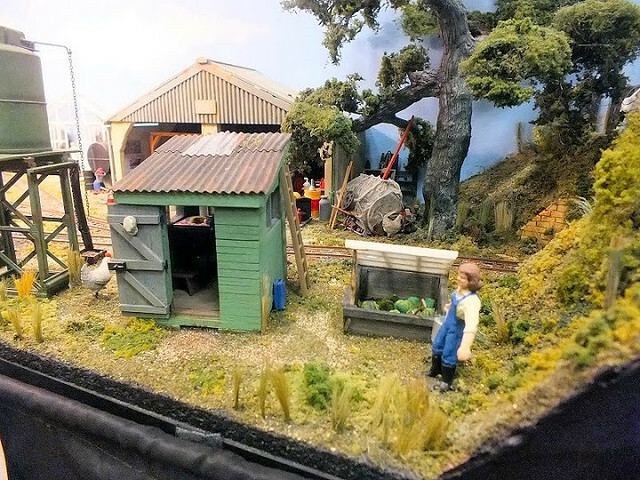 A couple of shots I took at the Small Layout Show at Werrington a few years ago. 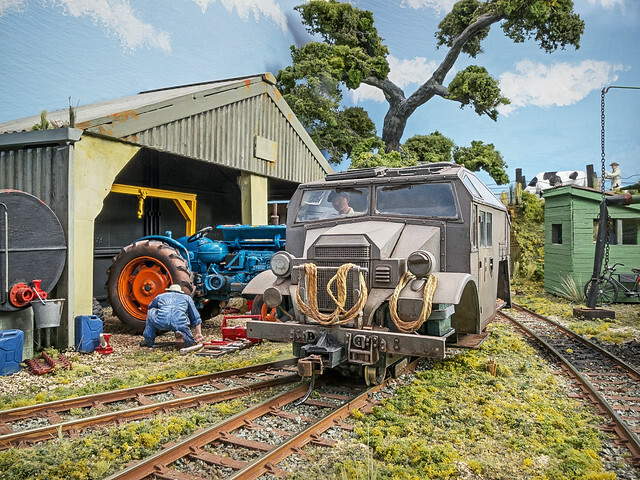 Really no enough words in my vocabulary to express how much I like your layout, just a little question: when in exhibition, do you turn your lorry based engines once they get at the end of the track or send them back in reverse? and it you turn them how do you do it .... the "big hand from the sky" method? Franco many thanks for your kind words they are much appreciated.